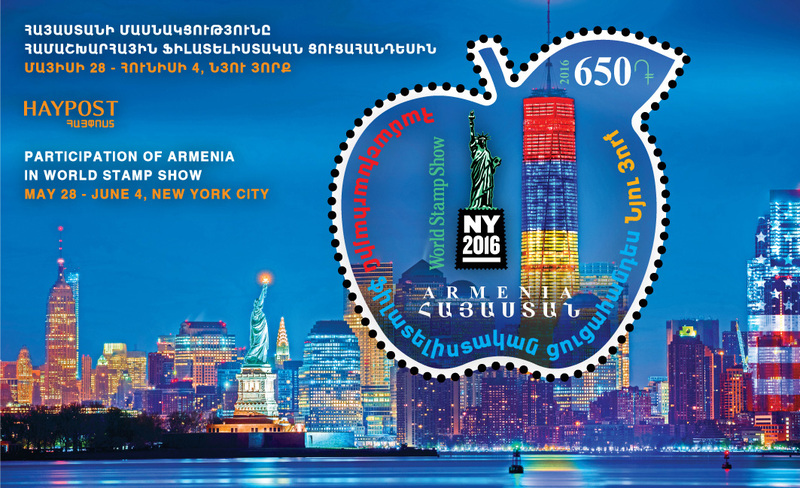 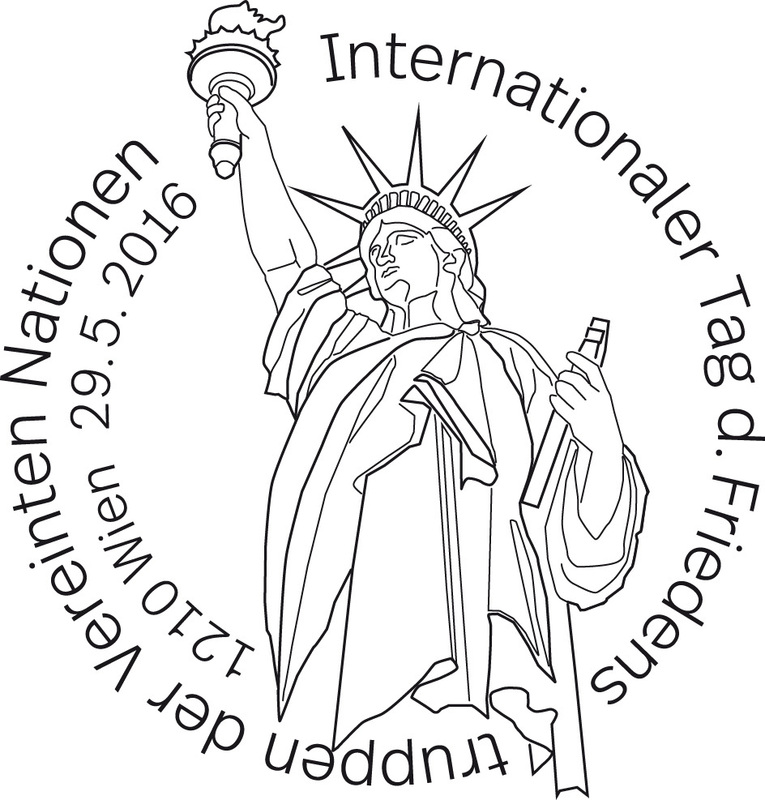 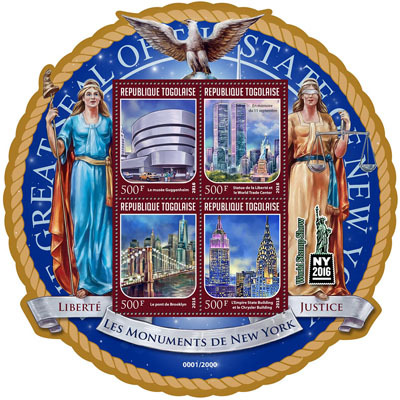 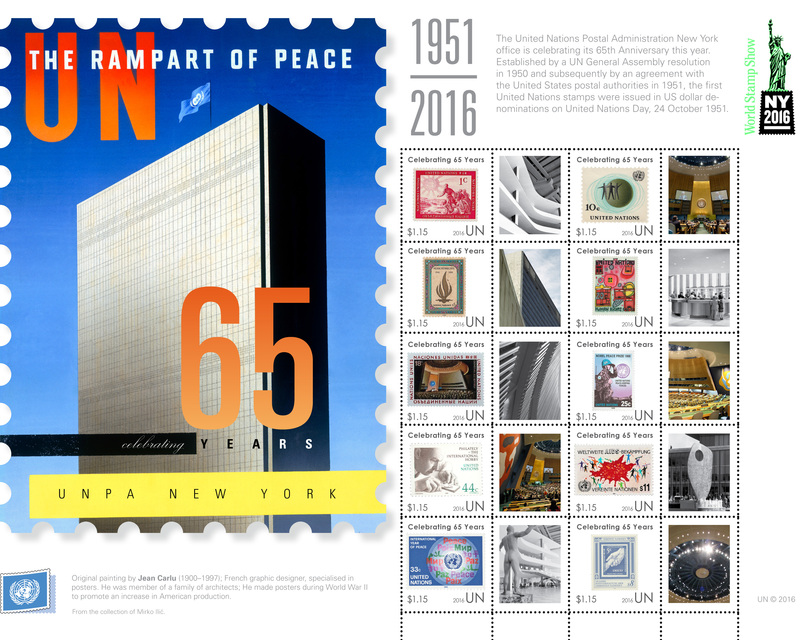 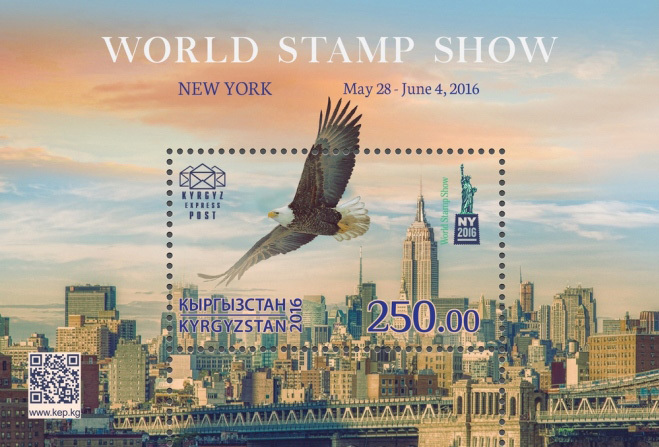 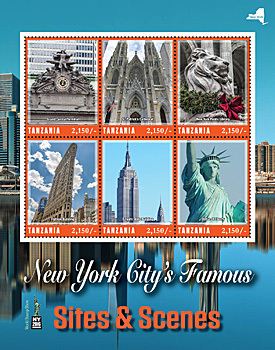 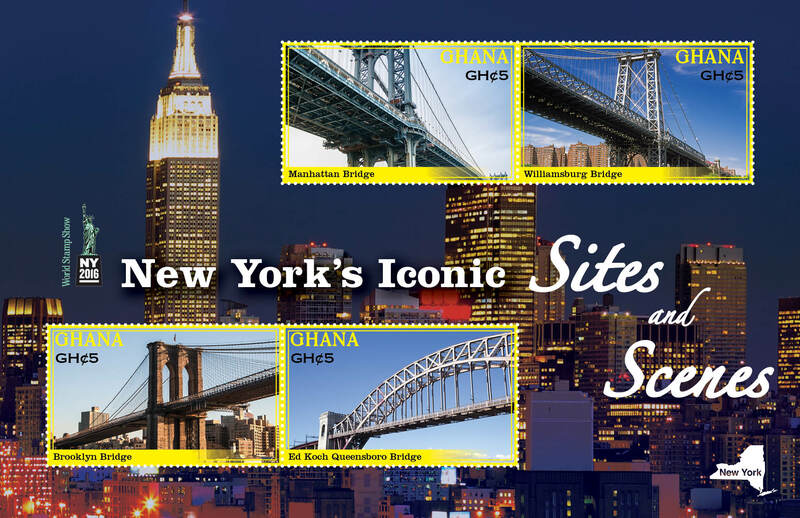 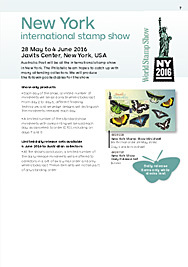 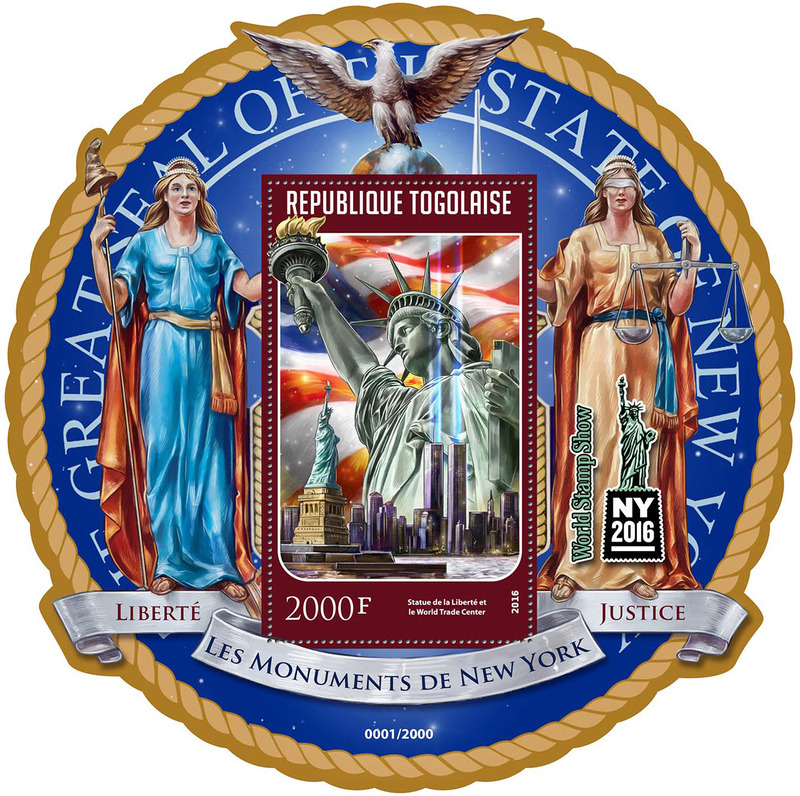 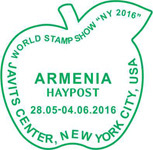 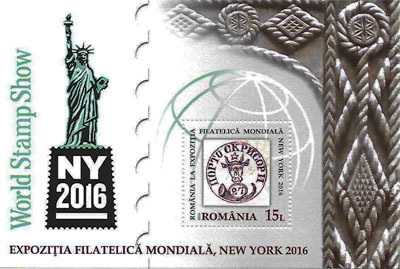 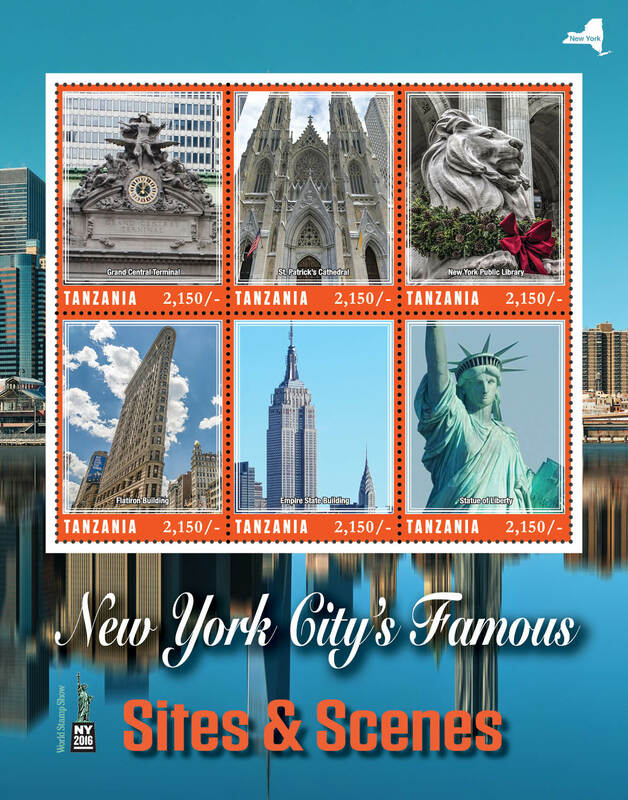 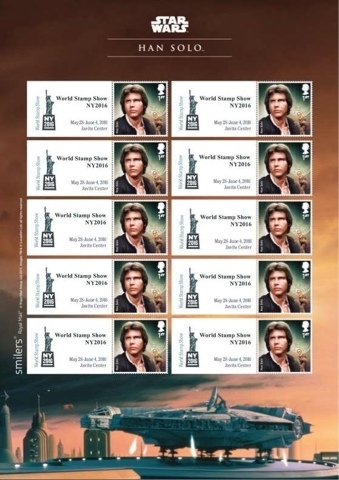 World Stamp Show-NY 2016 is pleased to announce the following stamps and philatelic items that will be released during the show honoring this great event. 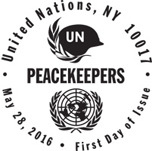 First Day ceremony information will appear here when confirmed. 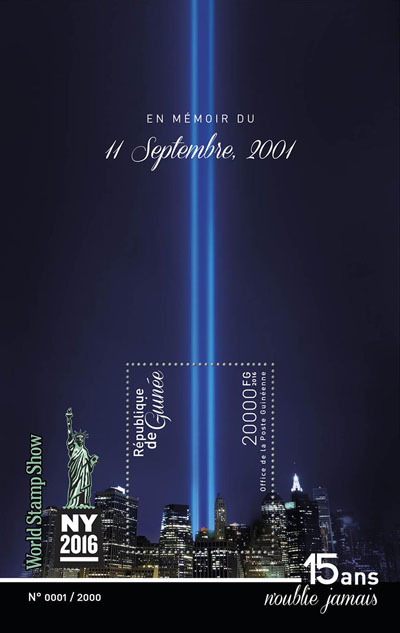 Ceremonies will be held on Level 1 in Rooms 1E12-14. 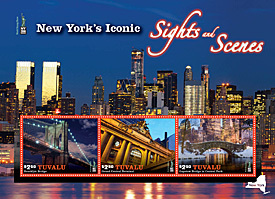 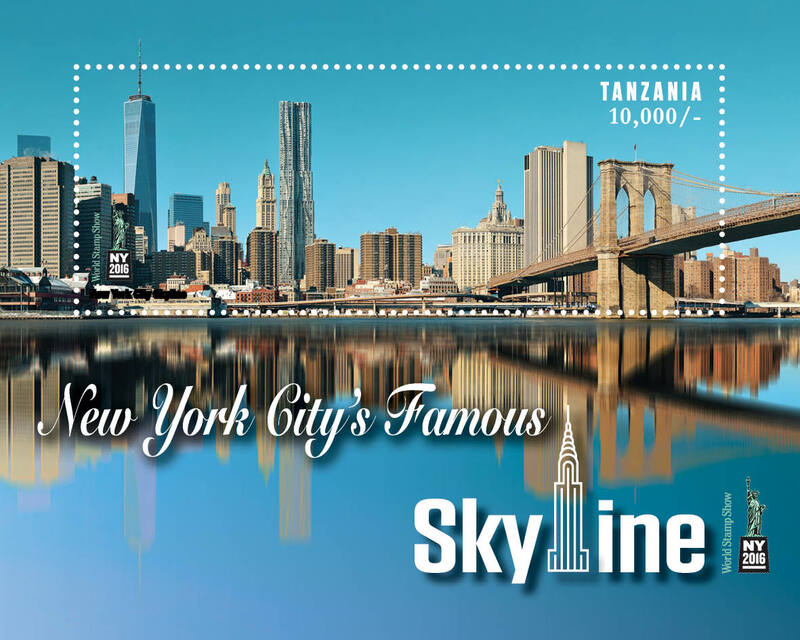 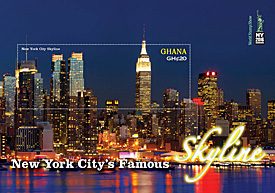 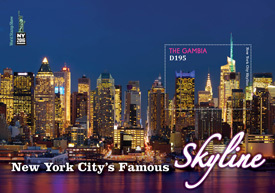 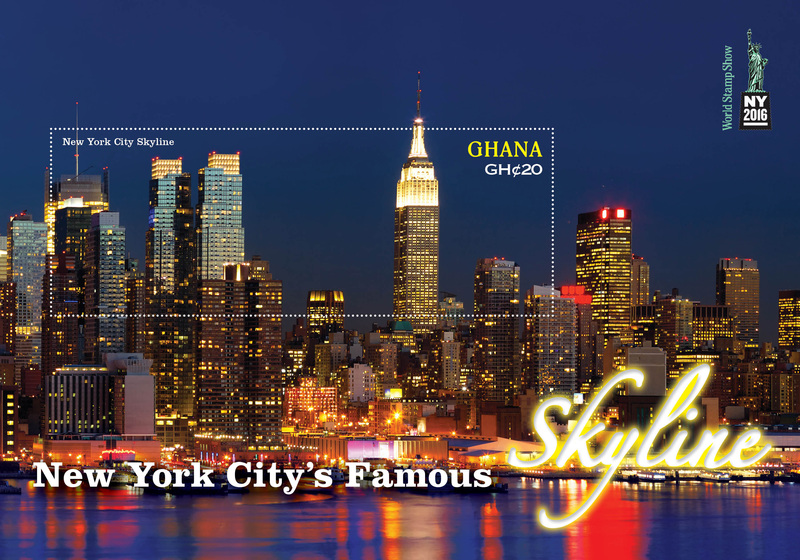 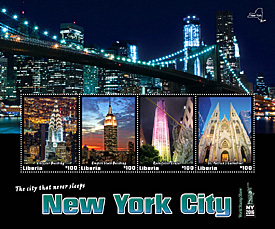 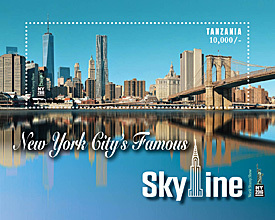 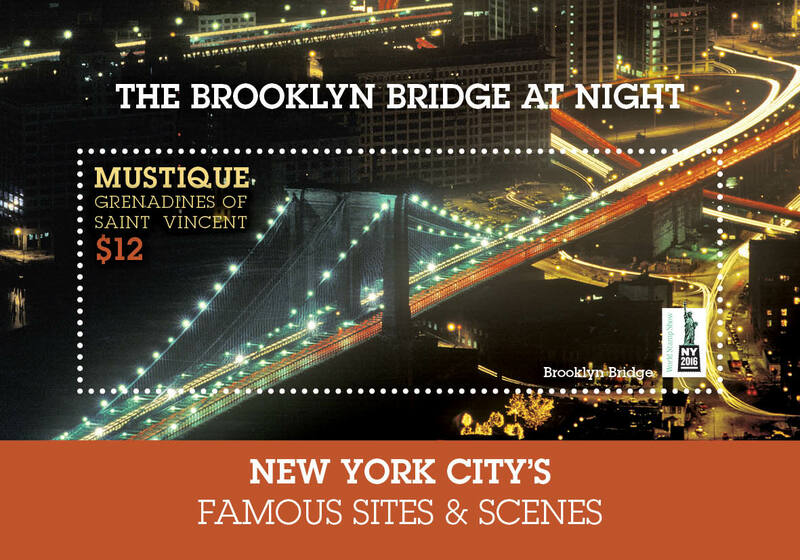 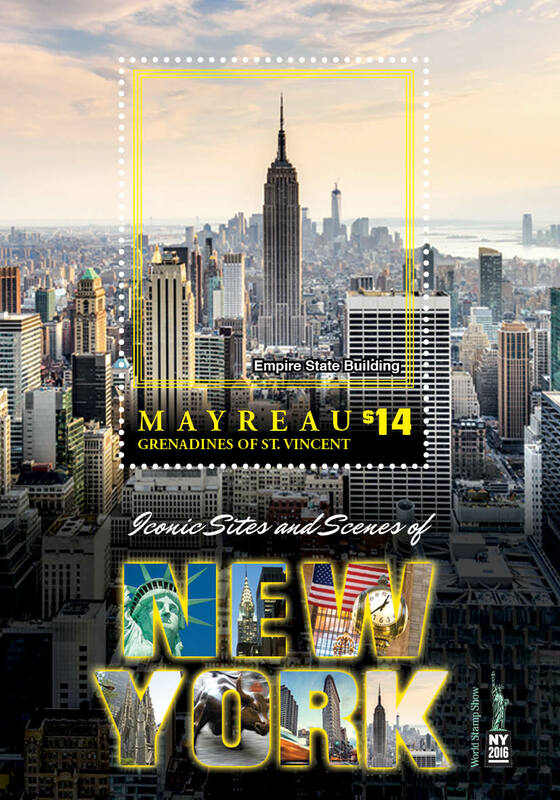 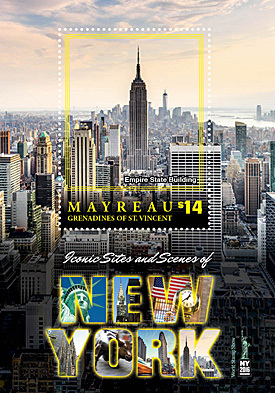 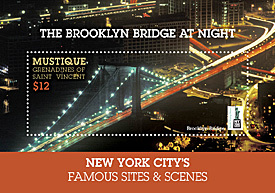 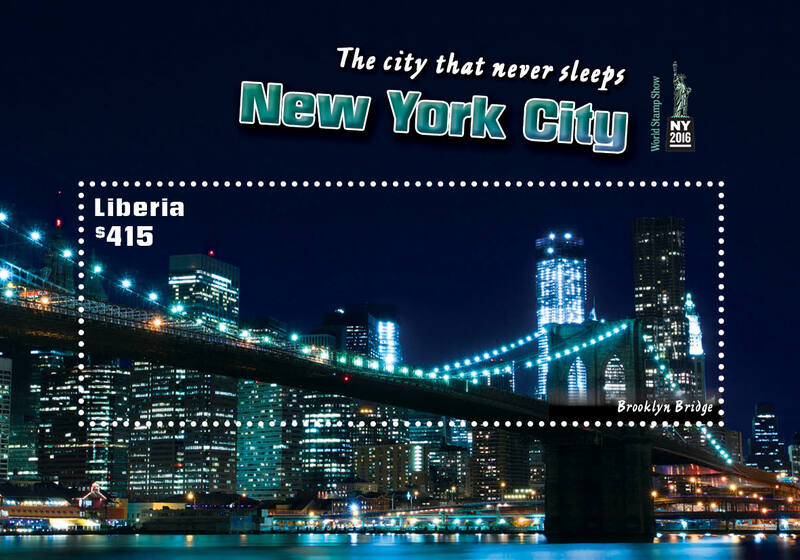 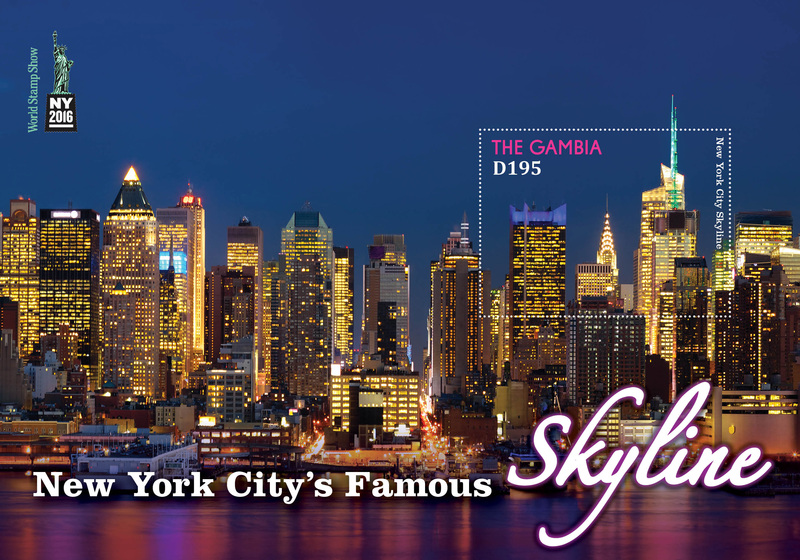 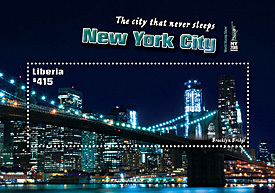 1 PM - Tuvalu/Gambia/Ghana "Beautiful New York Skyline at Night"
Each cancel is 3 inches wide by 1.6 inches high. 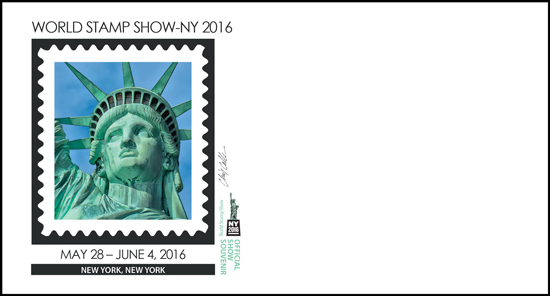 The official show cachets were designed by stamp artist Chris Calle and are representative of the theme of each day. 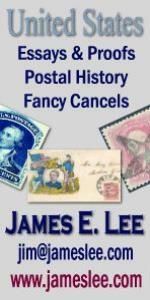 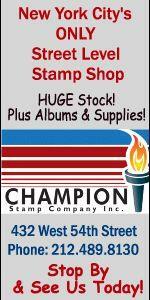 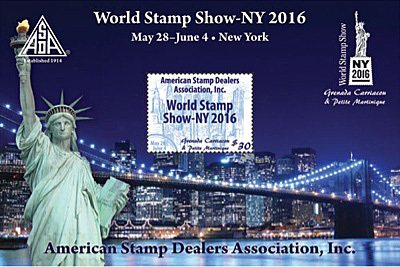 They are available at the show or through advance orders handled at by the Amerian Philatelic Society. 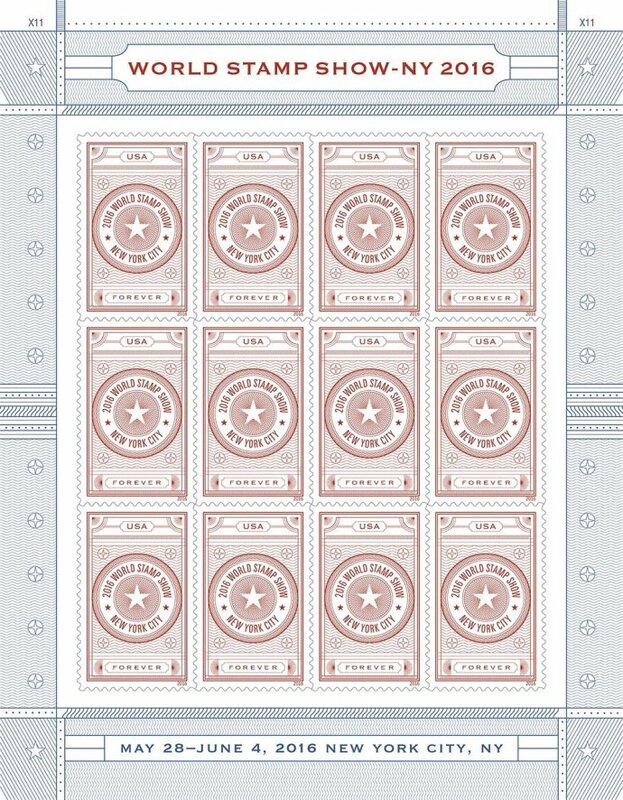 Prices are $2 per blank cachet/$16 per set of 8, $3 per serviced cachet/$24 per set of 8. 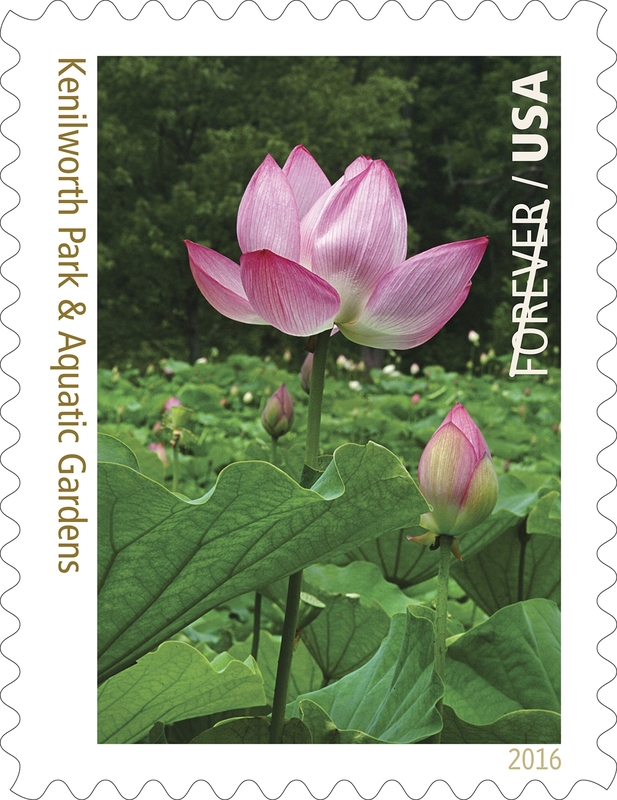 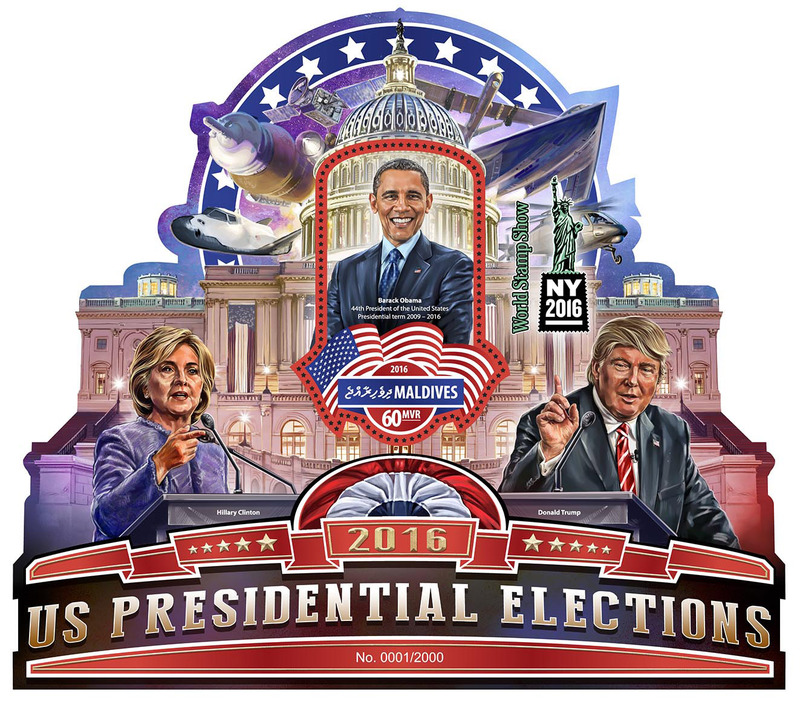 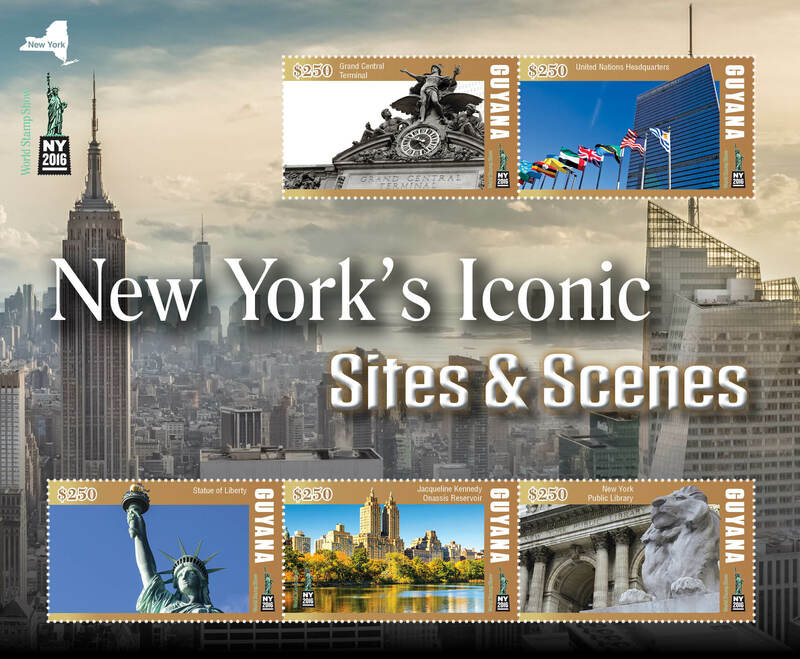 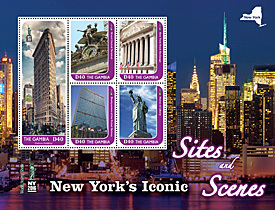 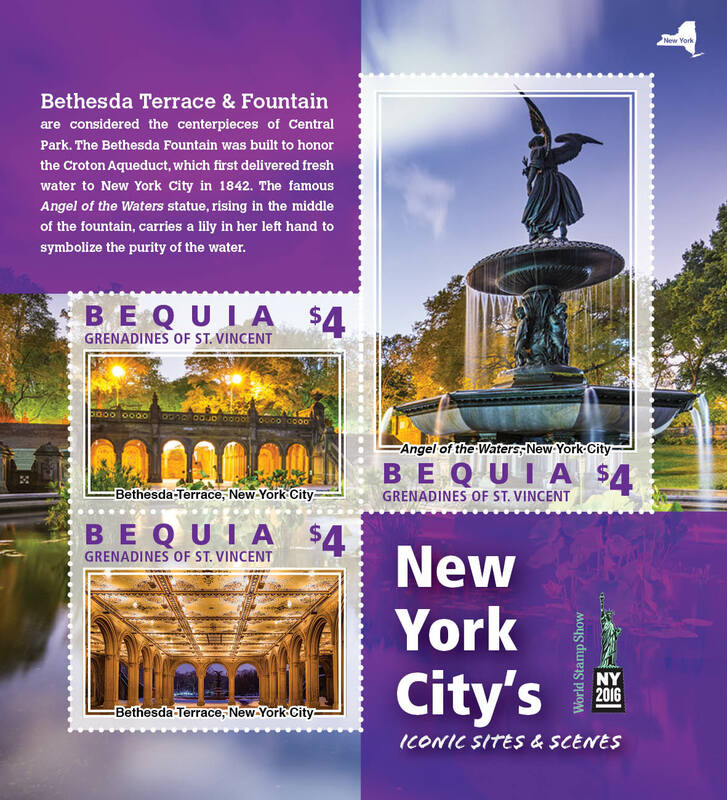 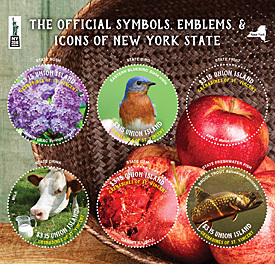 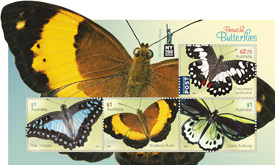 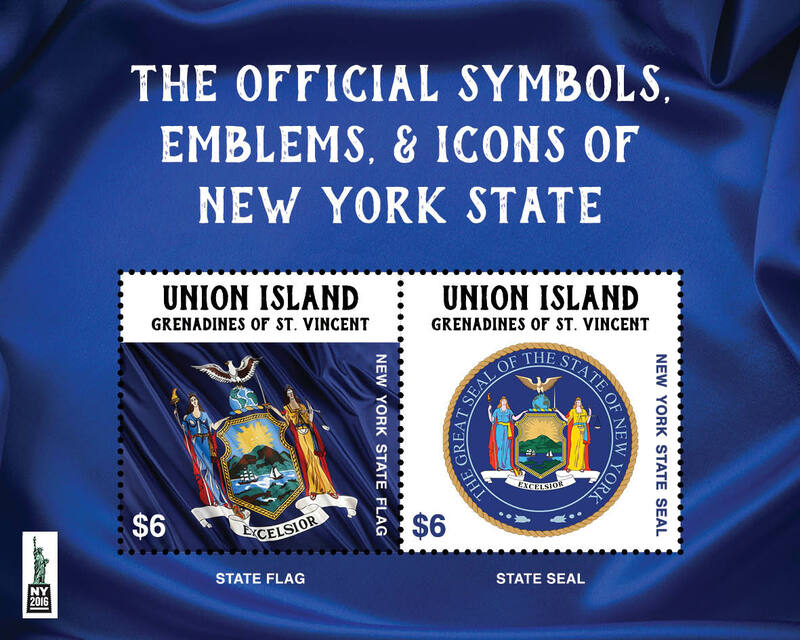 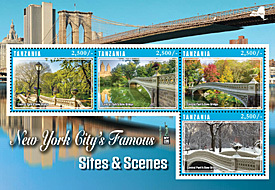 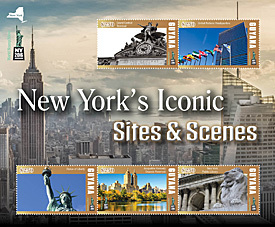 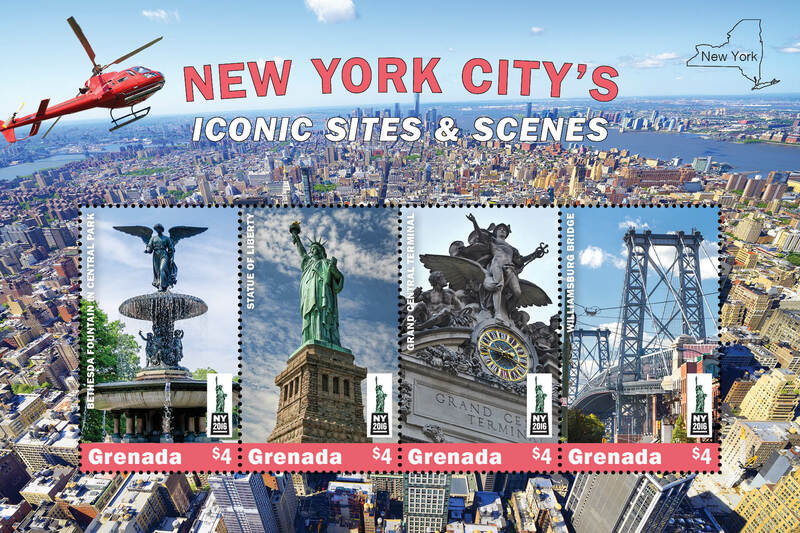 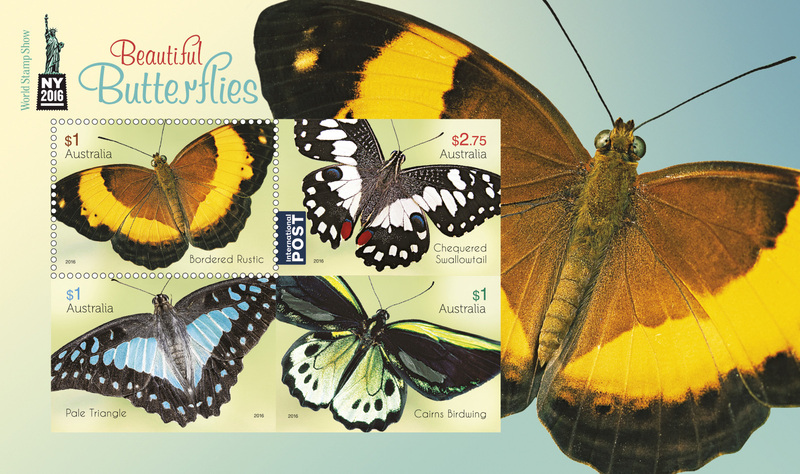 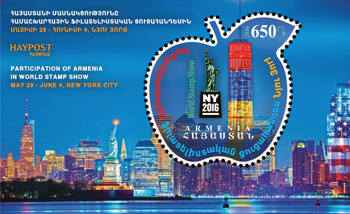 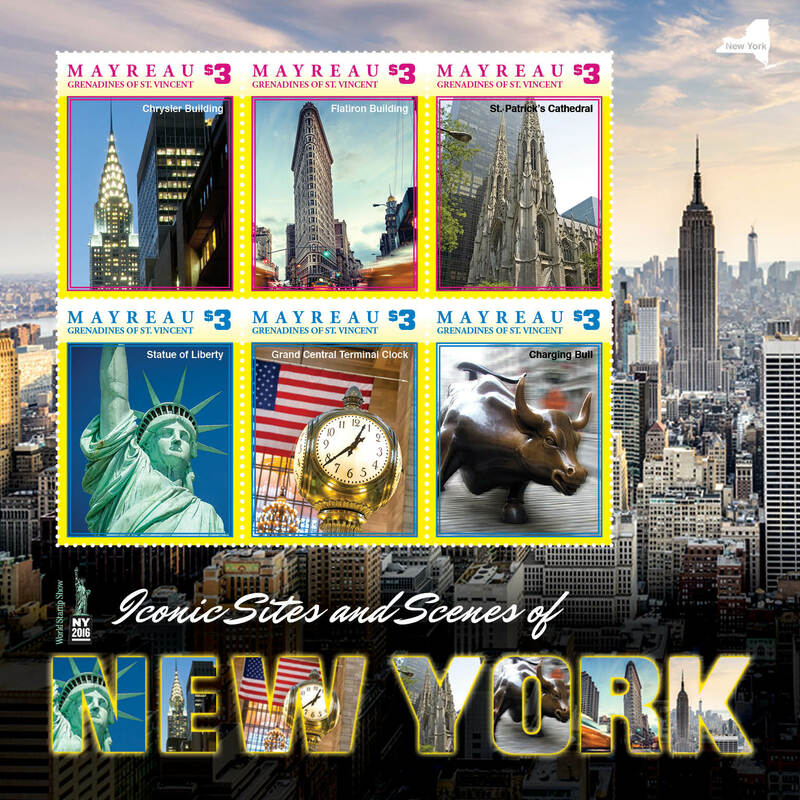 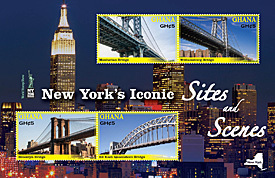 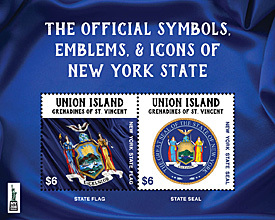 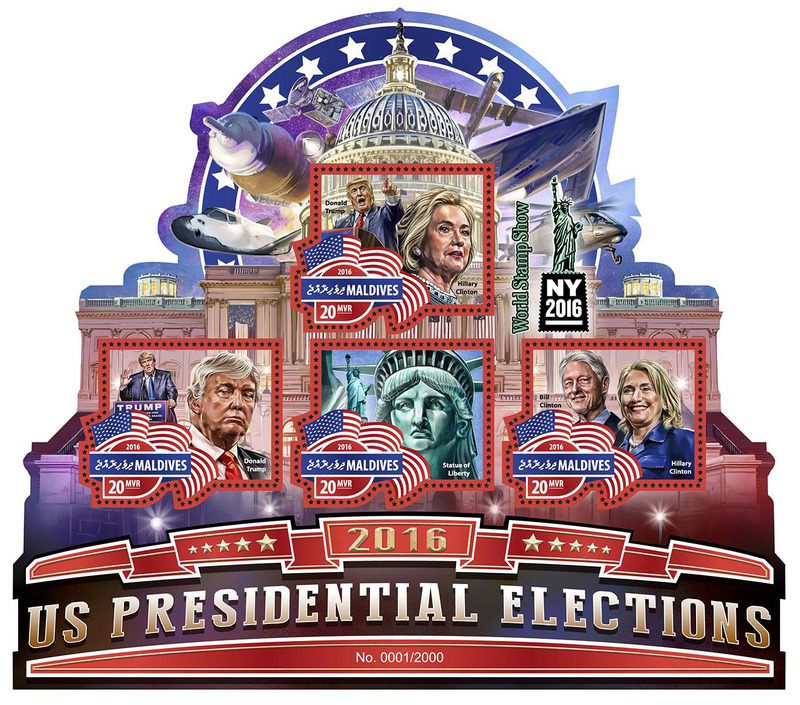 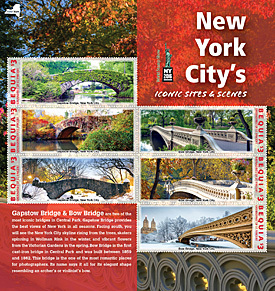 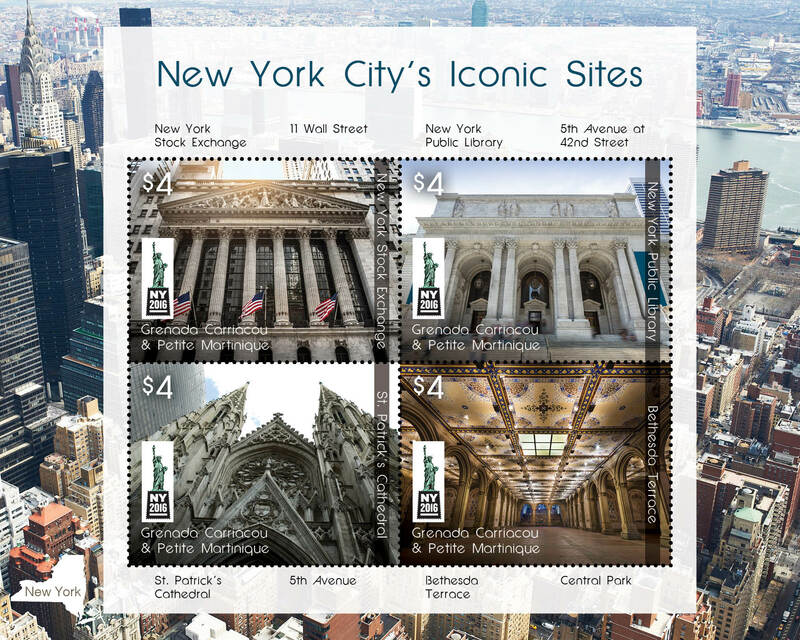 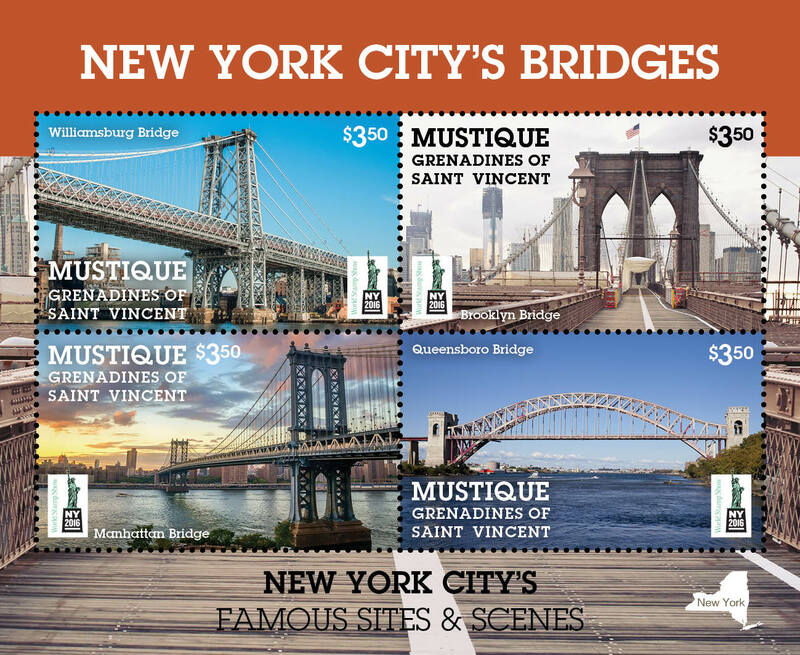 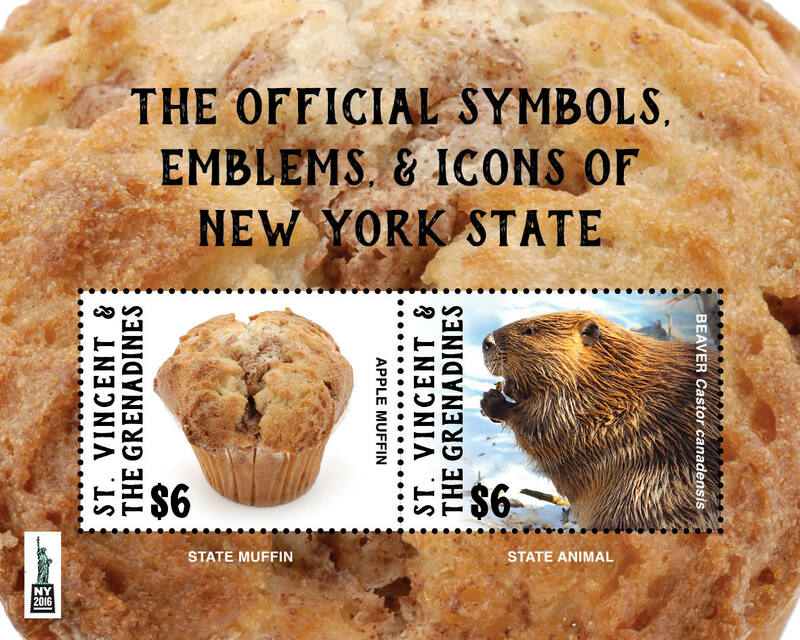 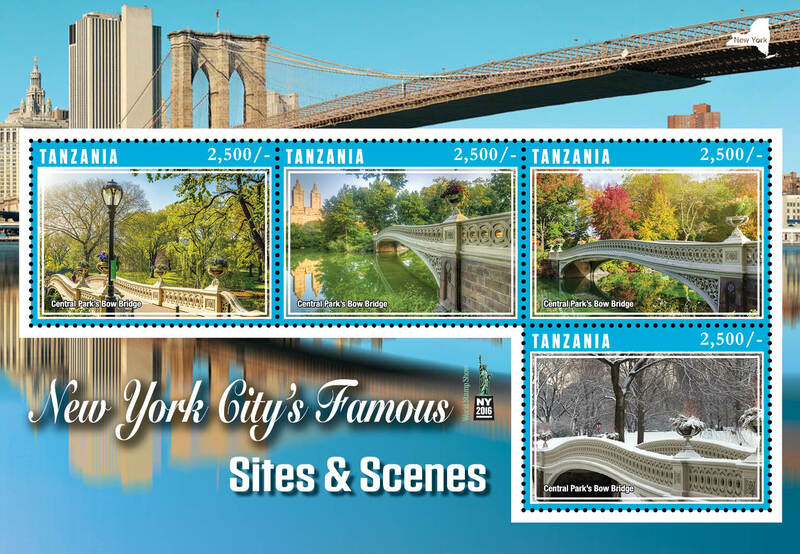 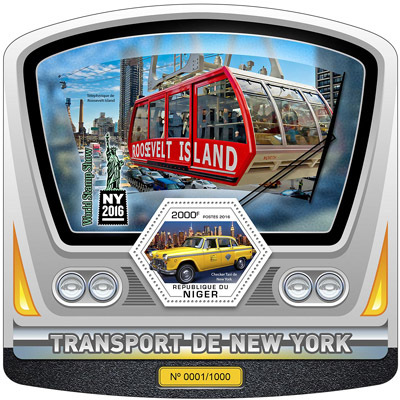 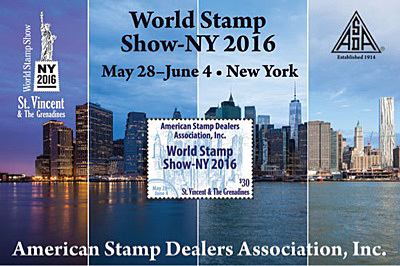 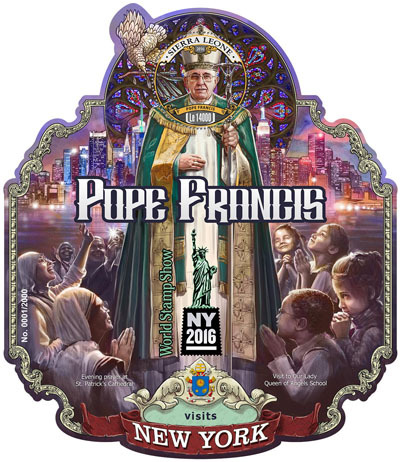 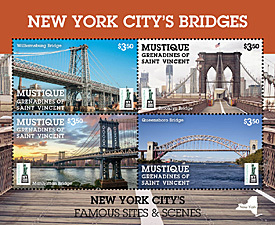 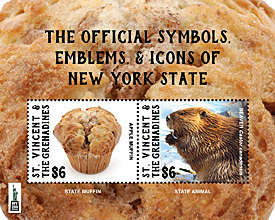 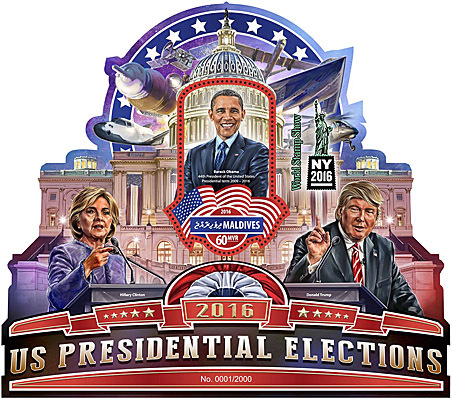 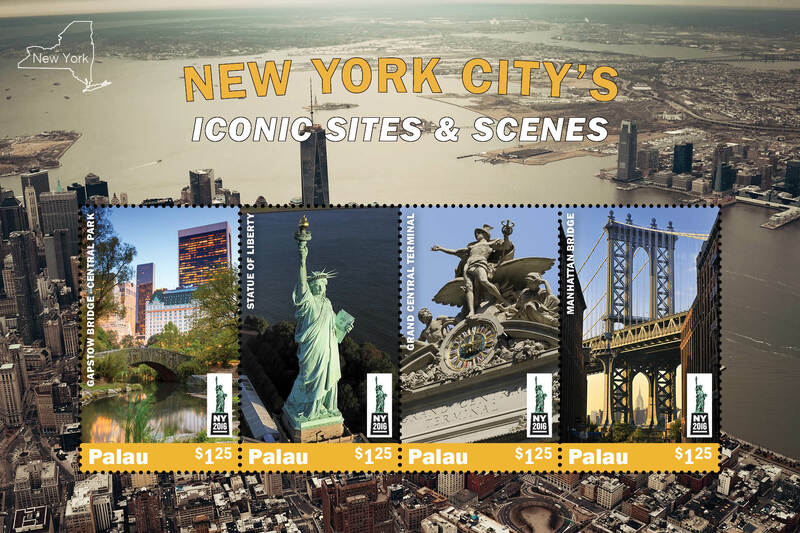 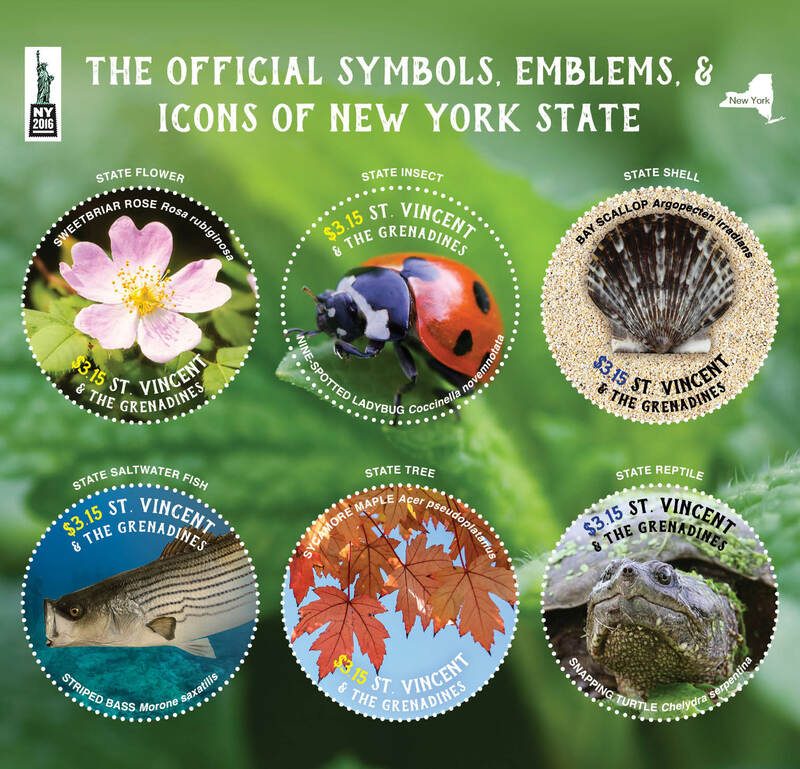 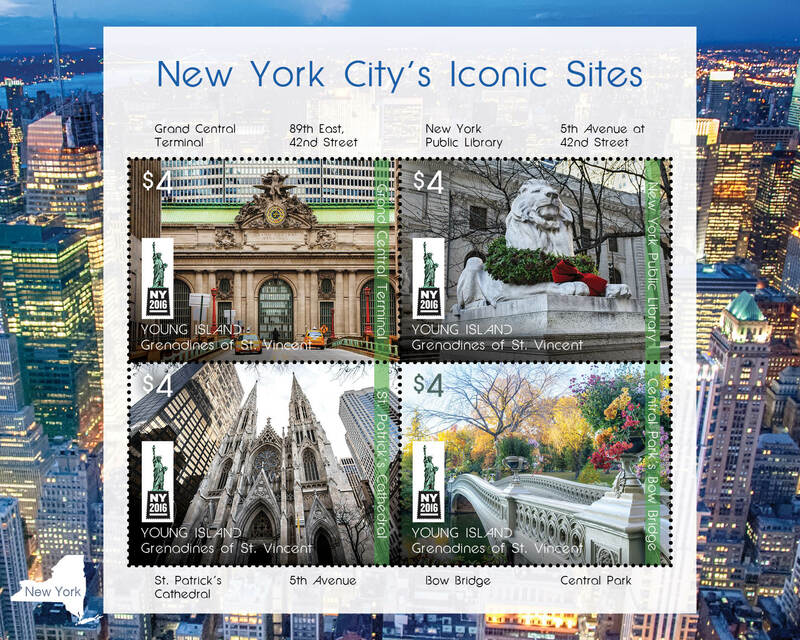 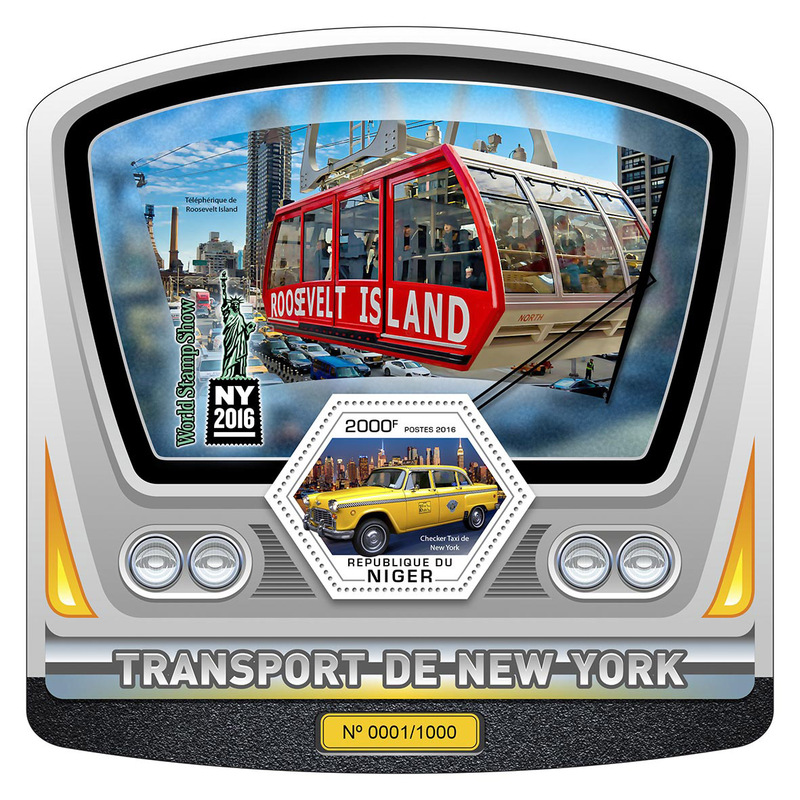 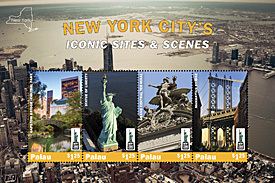 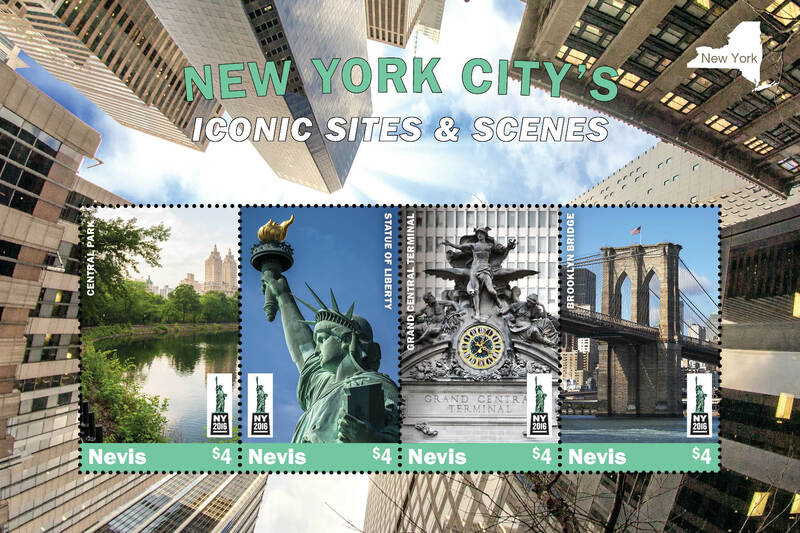 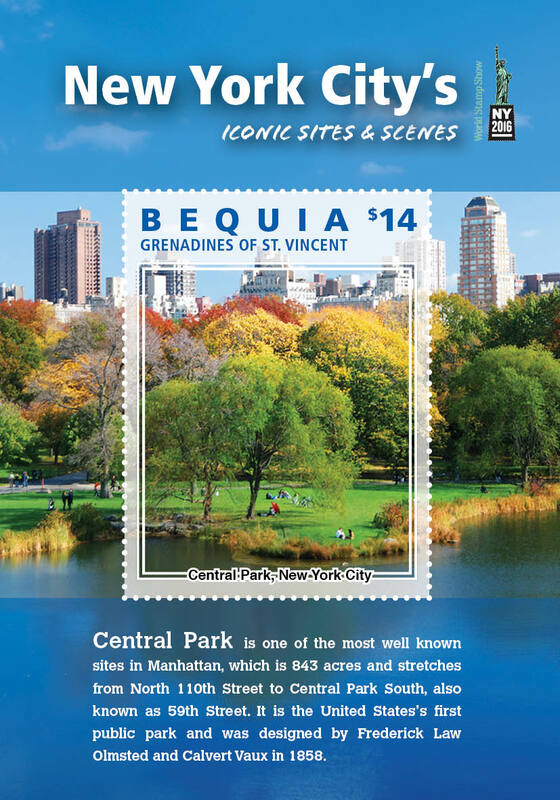 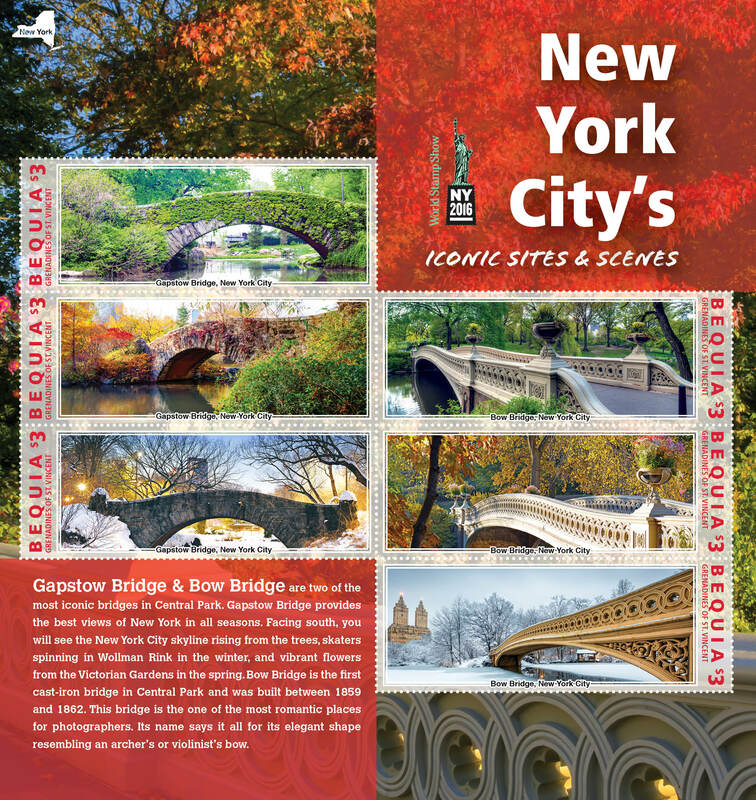 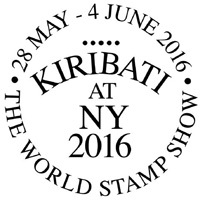 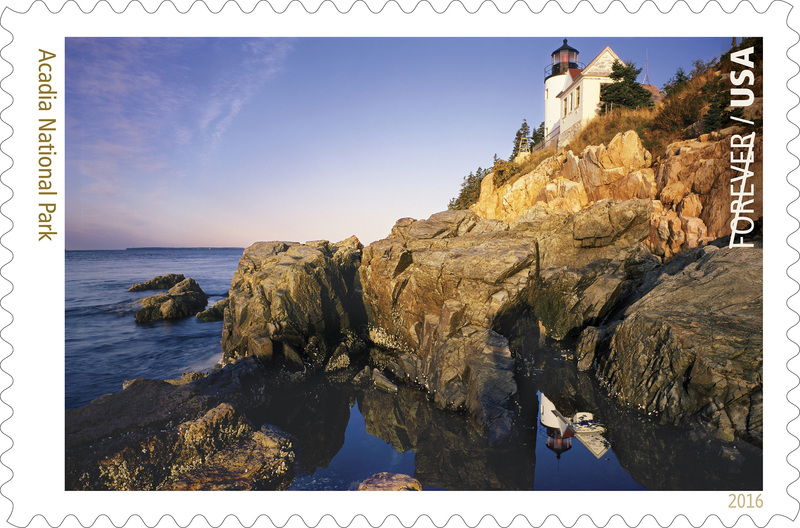 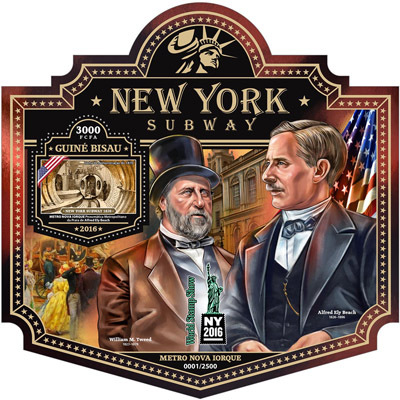 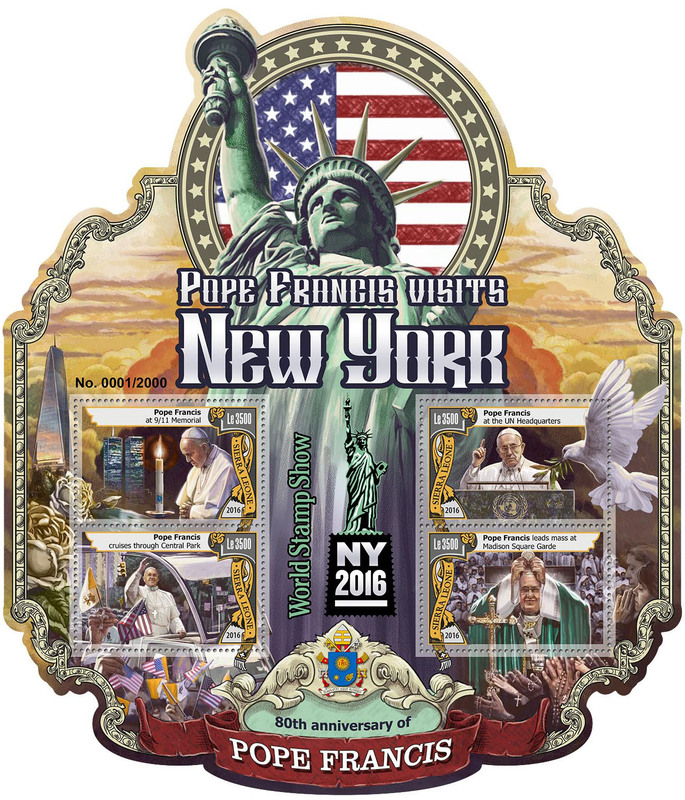 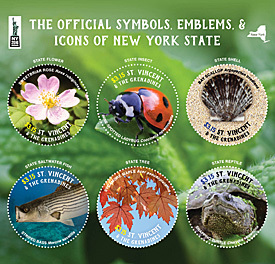 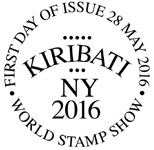 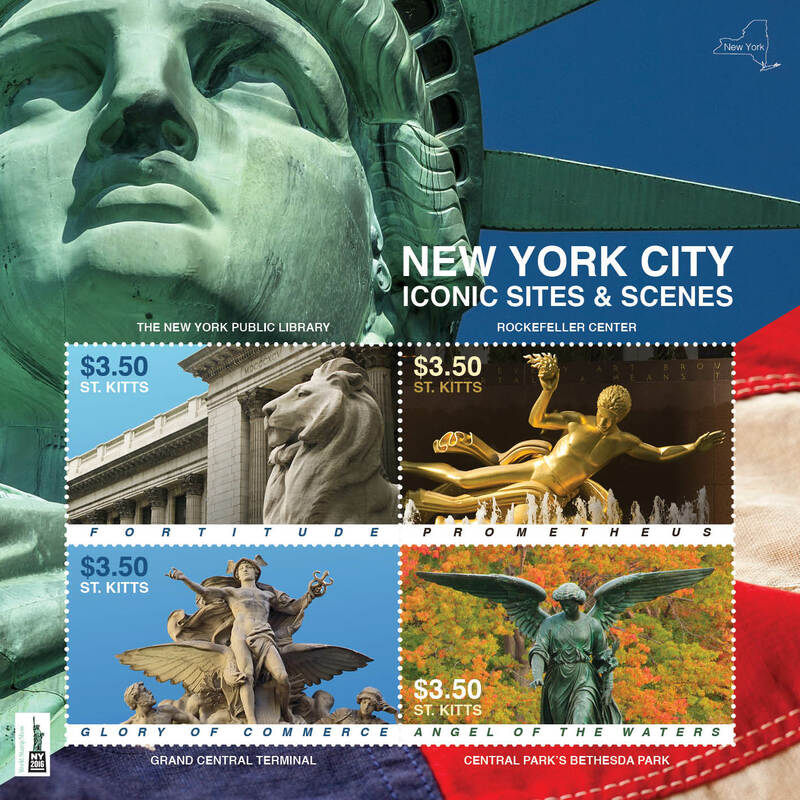 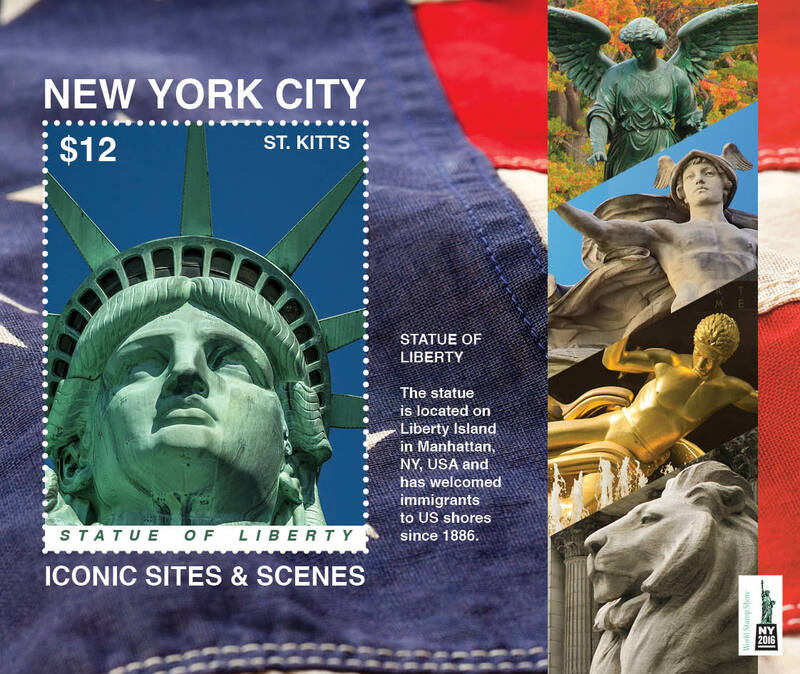 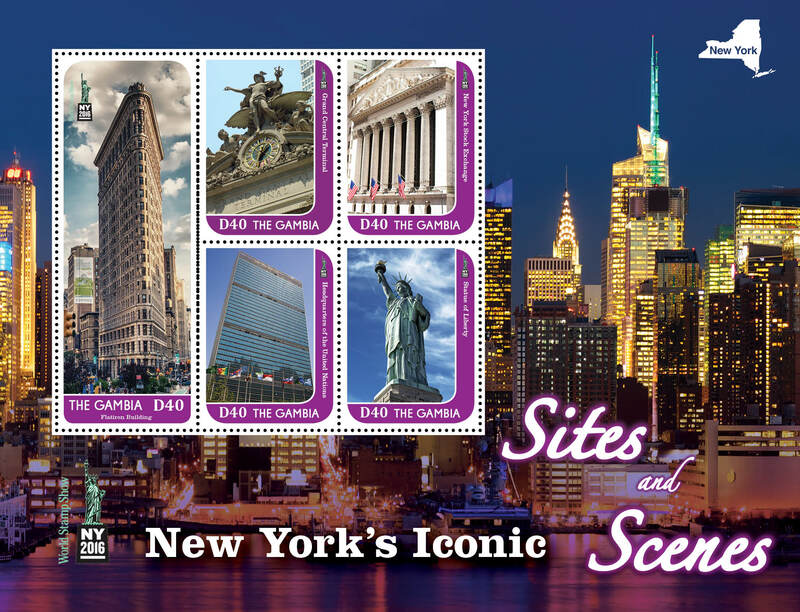 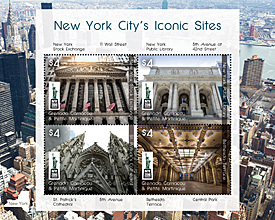 Orders may be placed online at http://stamps.org/DisplayPage.aspx?id=36&Search=NY2016. 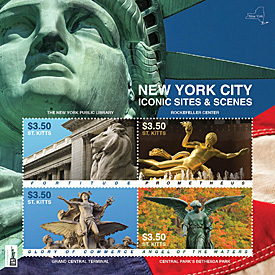 A separate generic Lady Liberty cachet is also available for $2 each. 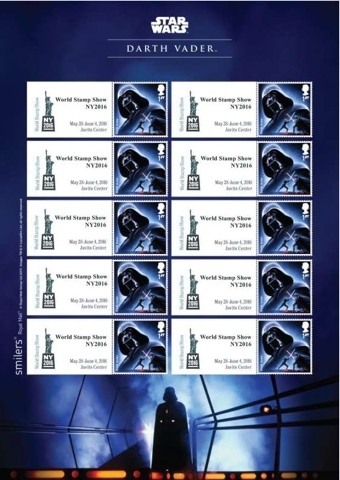 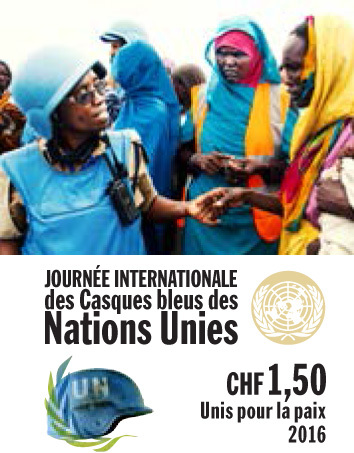 A total of 3,000 of each cachet is being produced. 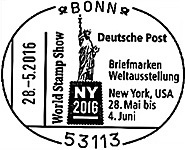 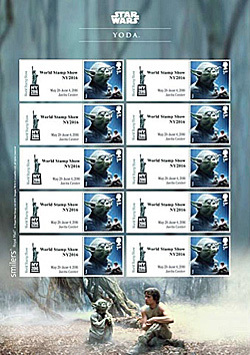 The first stamps issued to promote the show were issued on August 20, 2015 at APS StampShow in Grand Rapids. 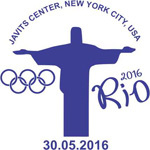 Watch that first day ceremony here. 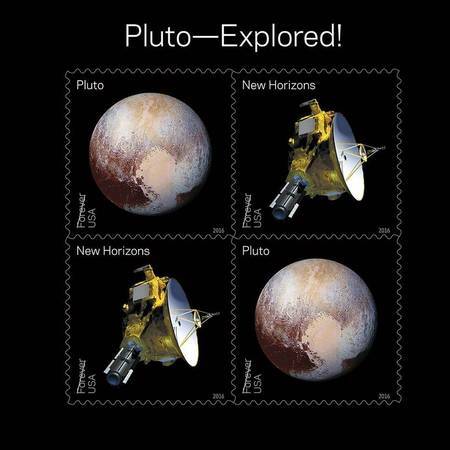 One of the follow-up issues is a close reproduction of them. 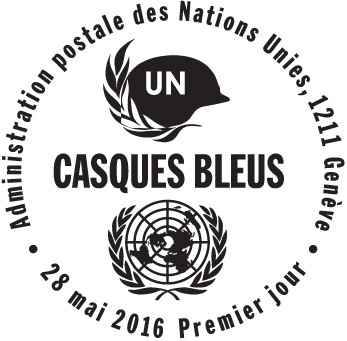 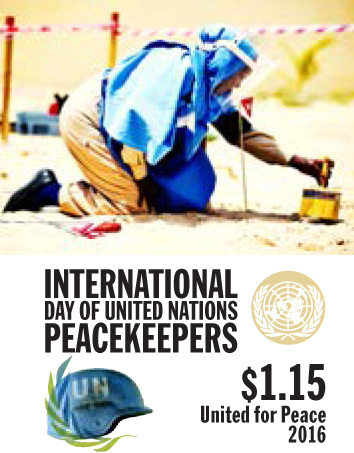 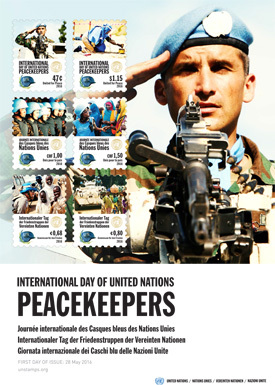 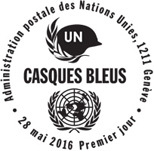 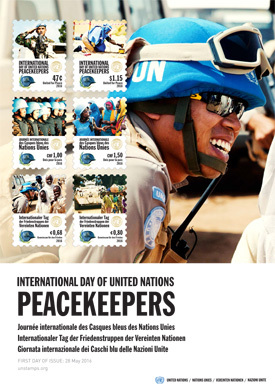 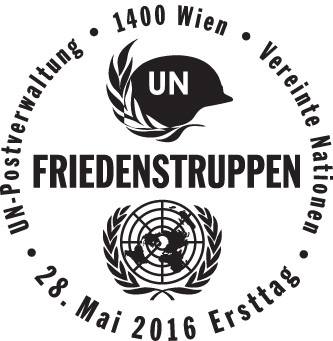 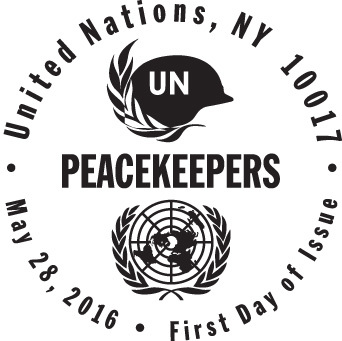 To date the United States Postal Service and United Nations Postal Administration will be hosting first day ceremonies for their issues. 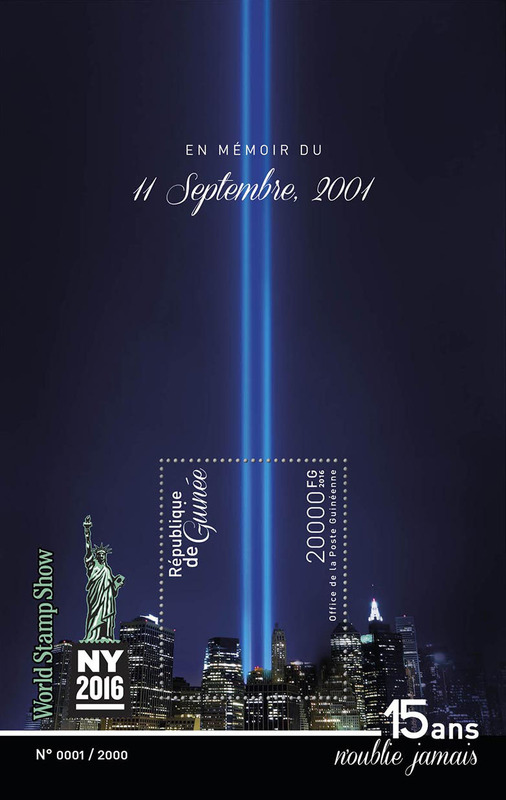 Several other countries will be selling show-related issues at their booths. 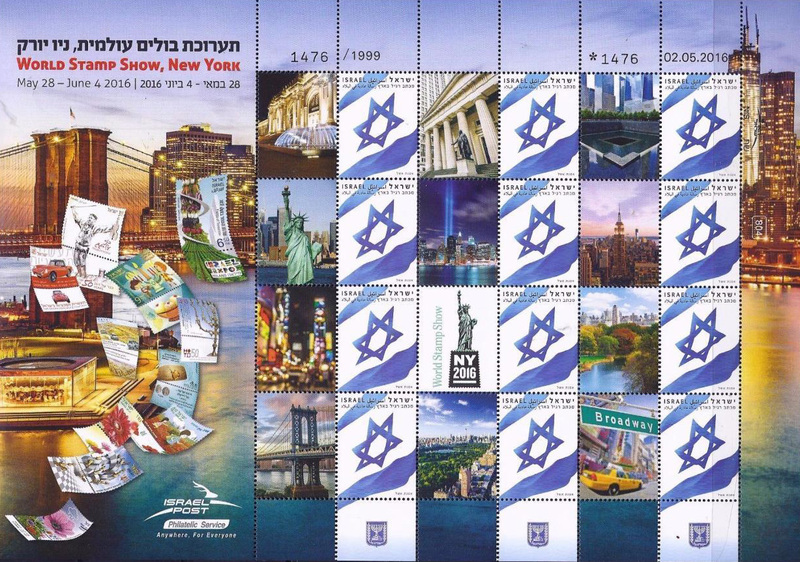 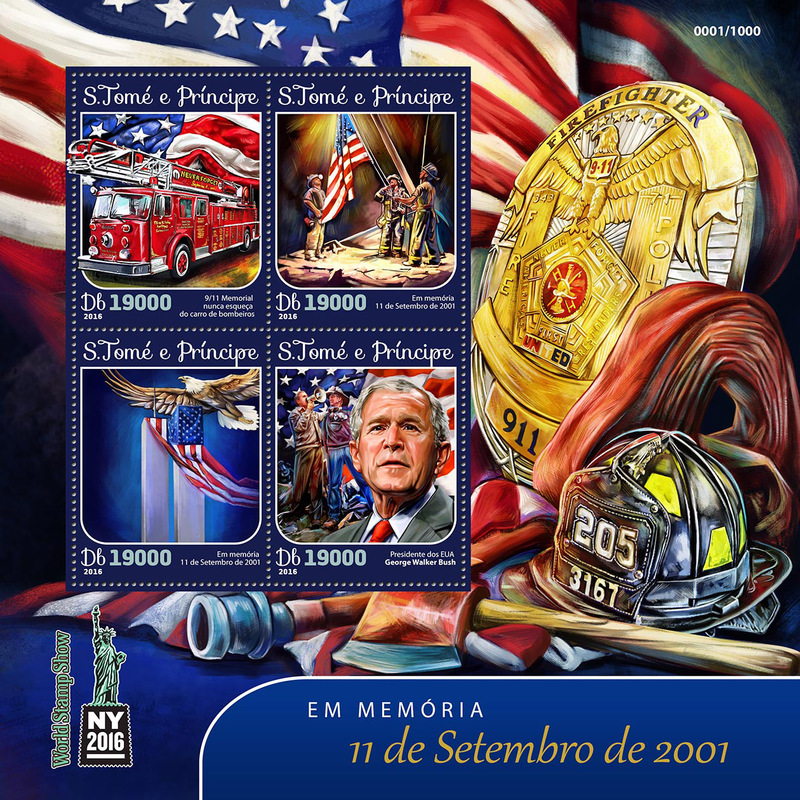 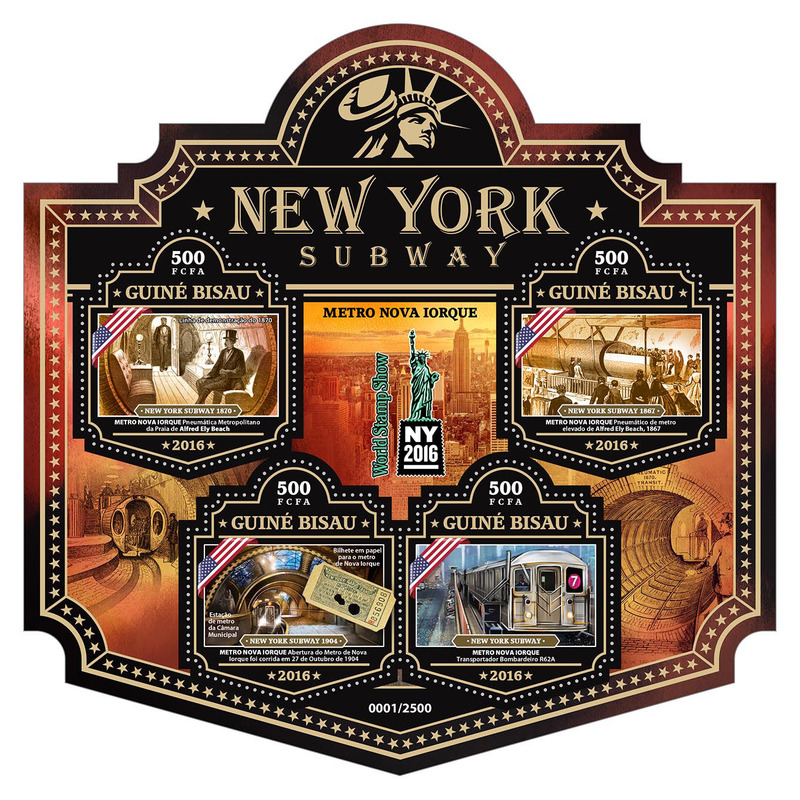 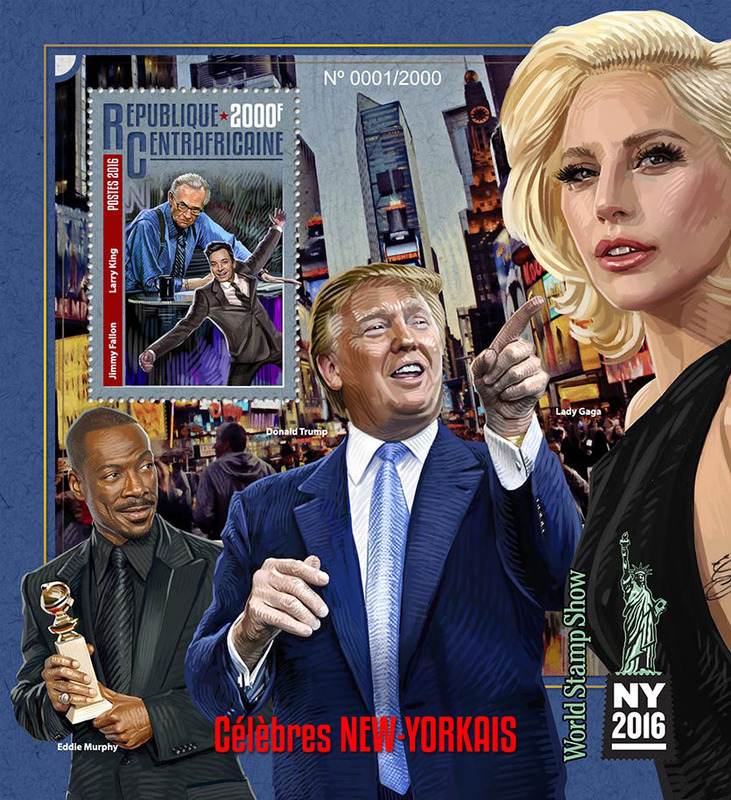 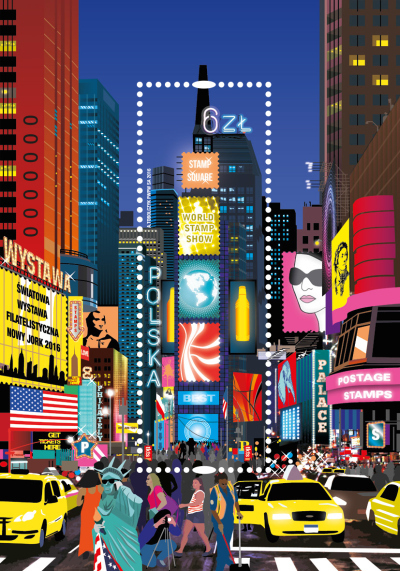 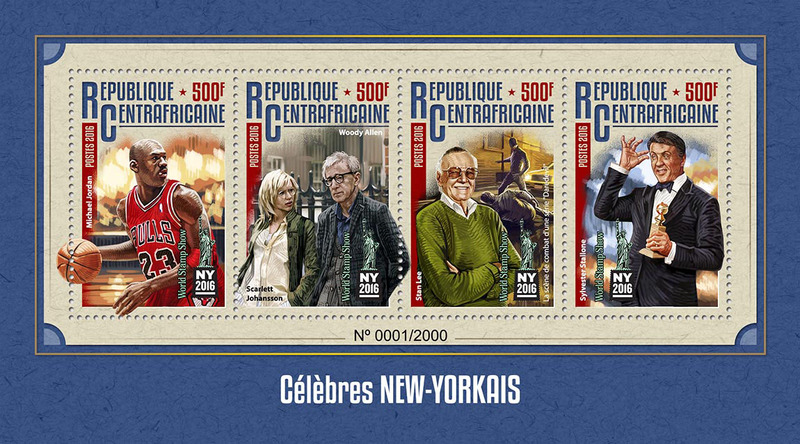 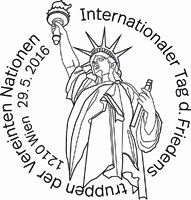 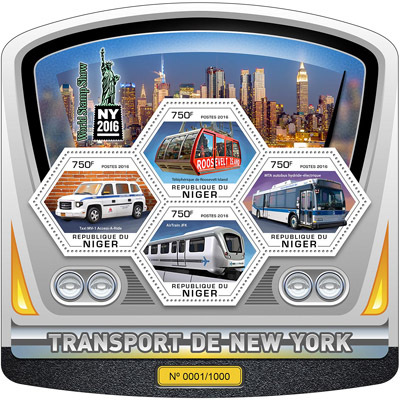 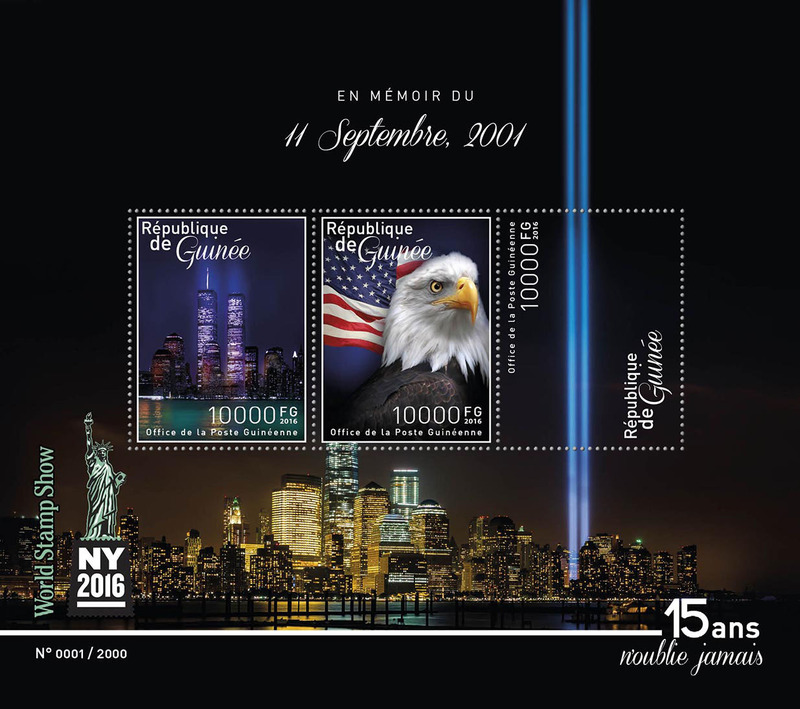 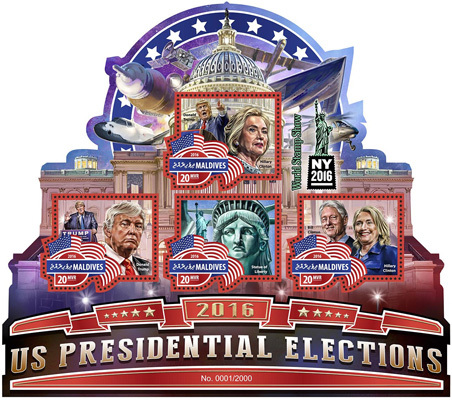 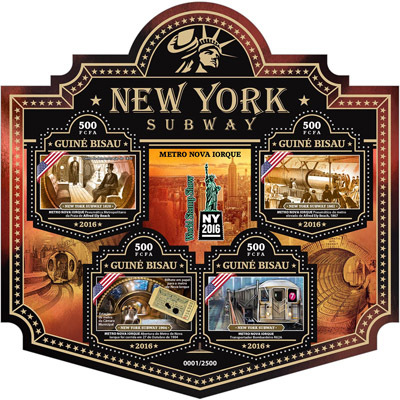 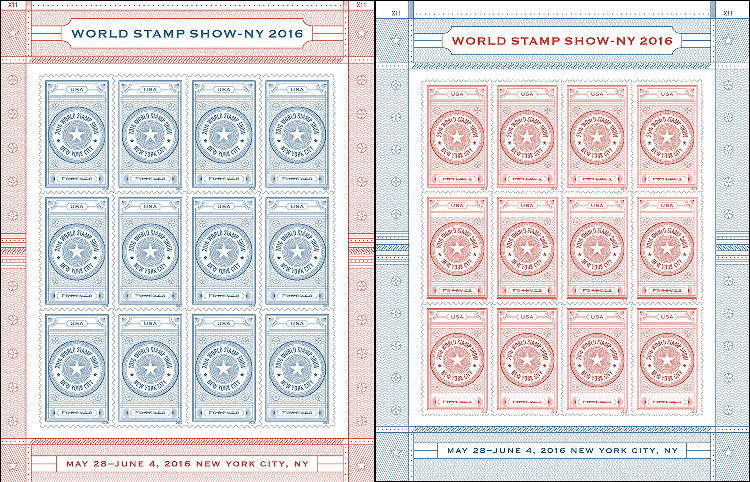 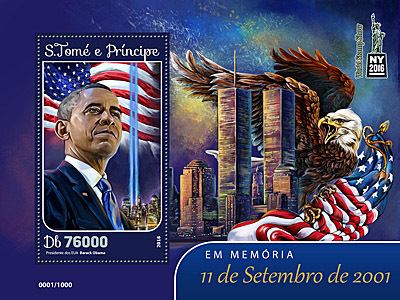 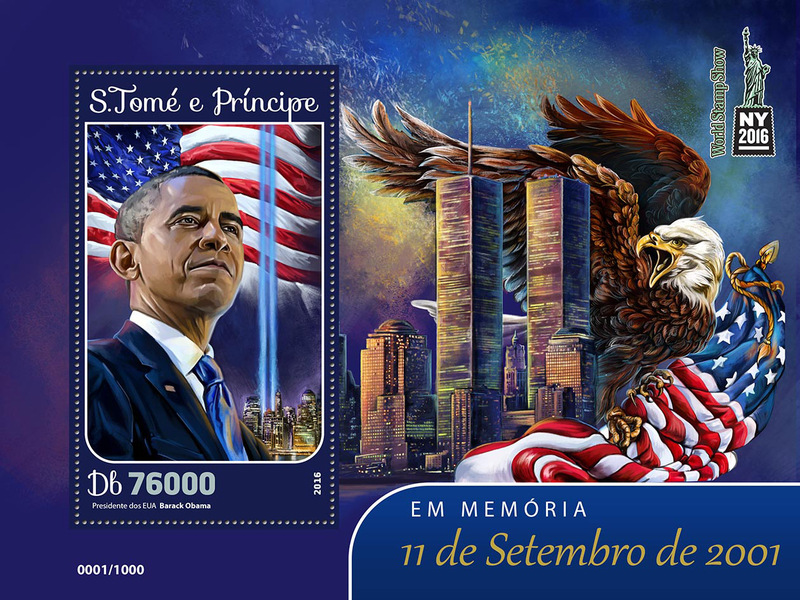 Two stamps celebrating the show in New York will be issued in a stamp folio consisting of two groups of 12 stamps in a single pane that can be folded. 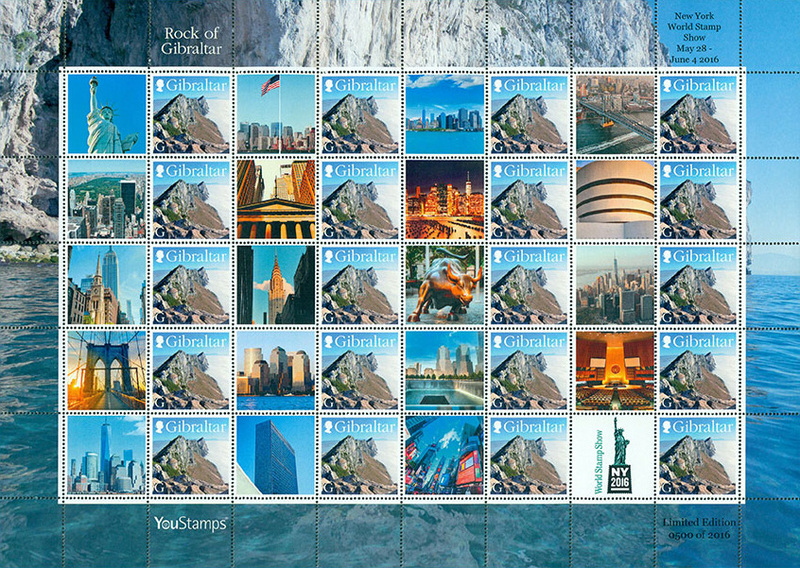 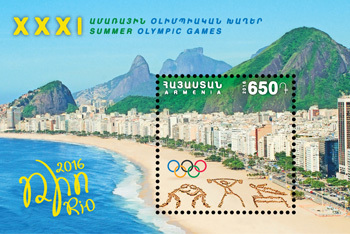 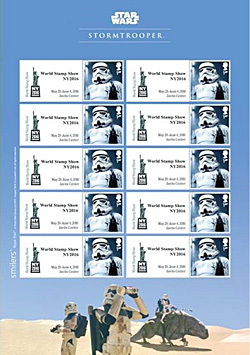 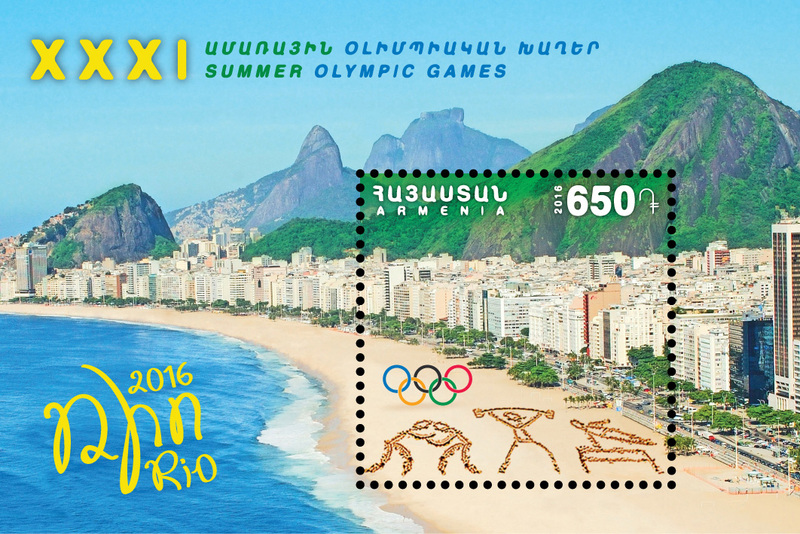 The designs are similar to the World Stamp Show-NY 2016 stamps issued last year on Aug. 20 (Scott 5010 and 5011). 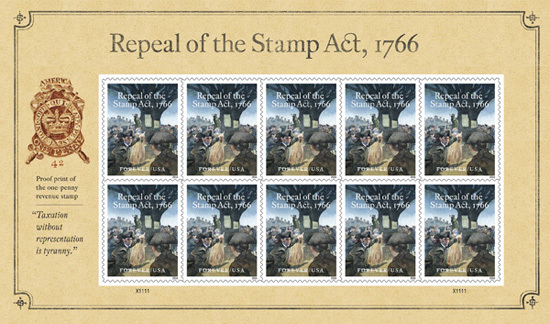 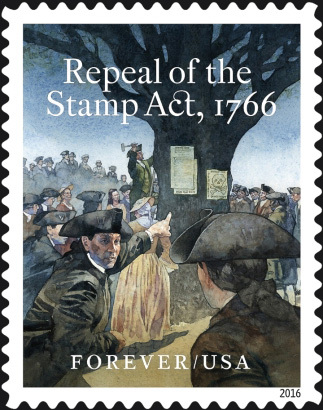 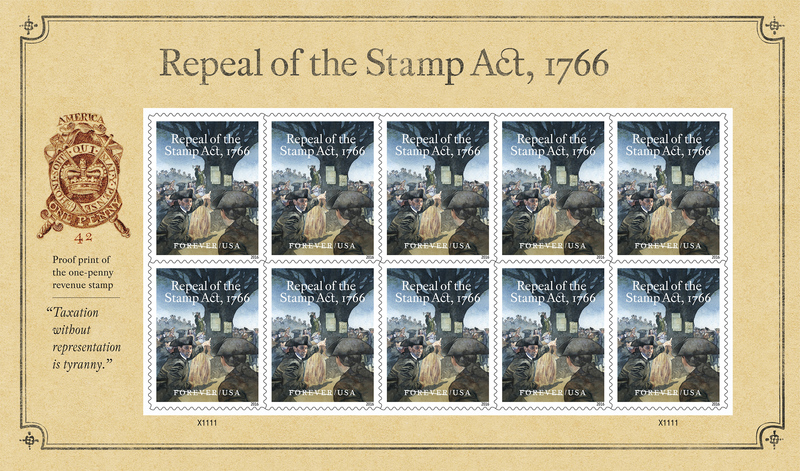 A single stamp commemorating the 1766 repeal of the Stamp Act will be issued in a pane of 10. Four forever stamps will be issued in a pane of 12 featuring medals honoring valor in combat: the Army’s Distinguished Service Cross, the Navy Cross for the Navy and Marine Corps, the Air Force Cross, and the Coast Guard Cross. 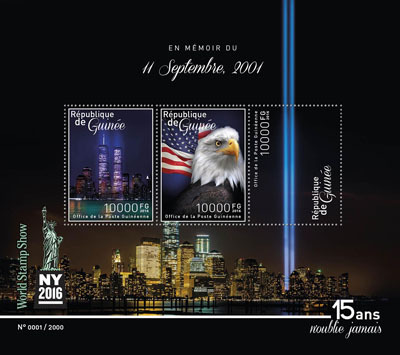 Each stamp shows one of the four medals suspended from a ribbon and shown against a dark blue backdrop. 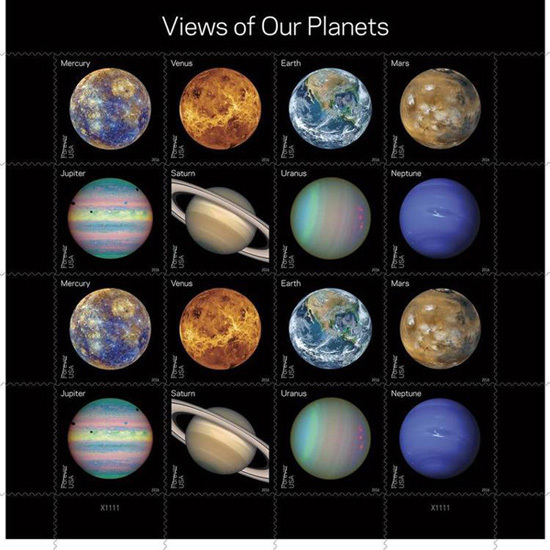 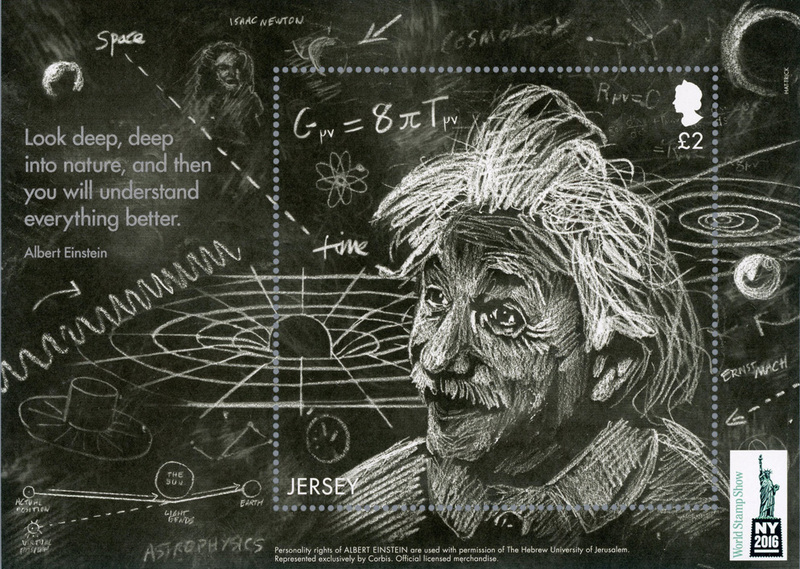 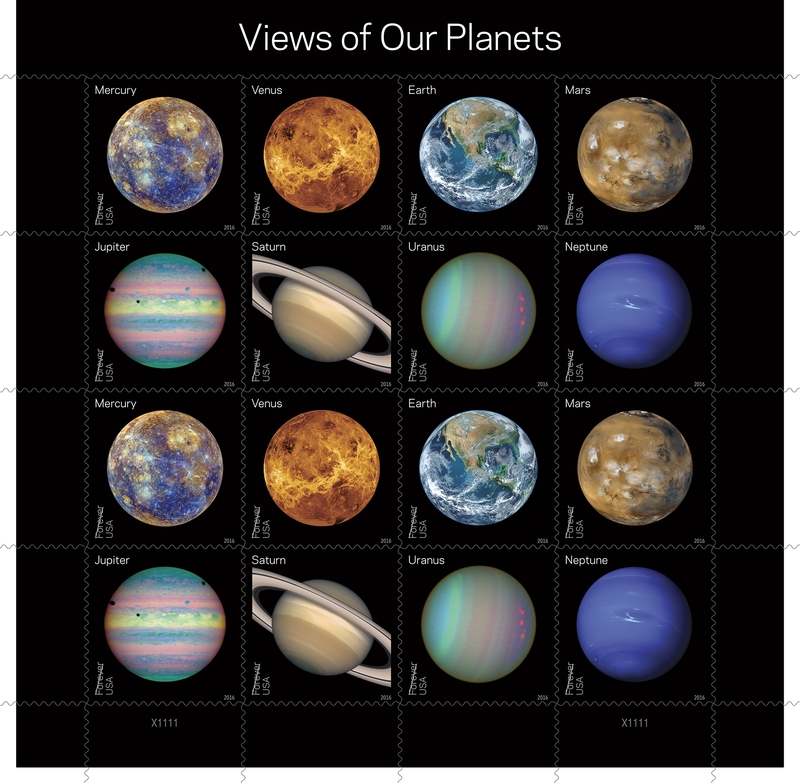 A pane of 16 stamps with eight different designs will feature the planets of our solar system. 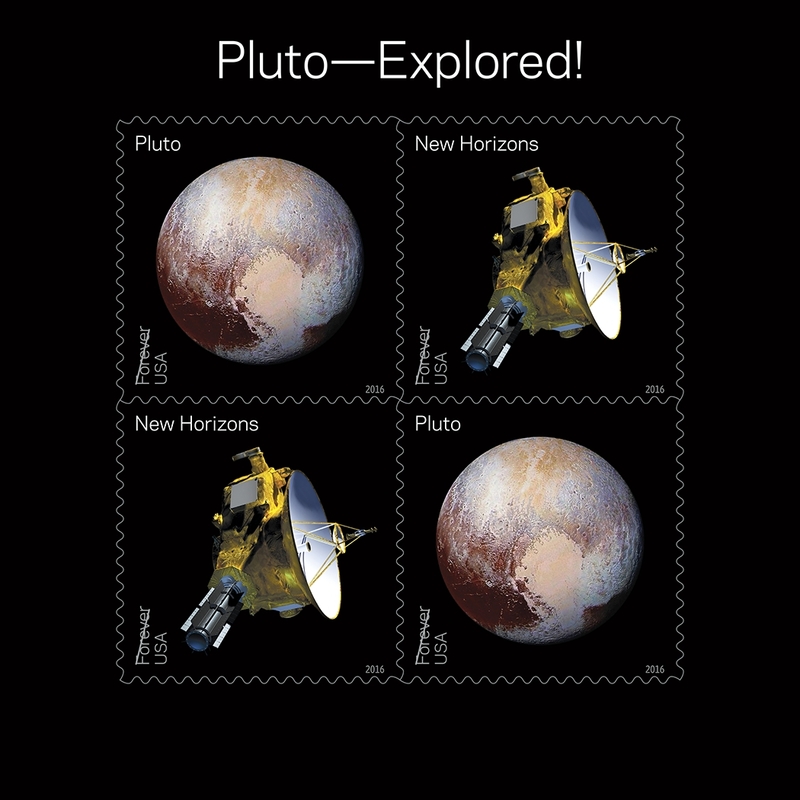 A separate pane of four stamps with two different designs will celebrate the recent approach of the New Horizons spacecraft to the dwarf planet Pluto. 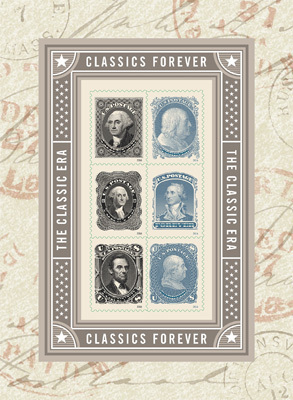 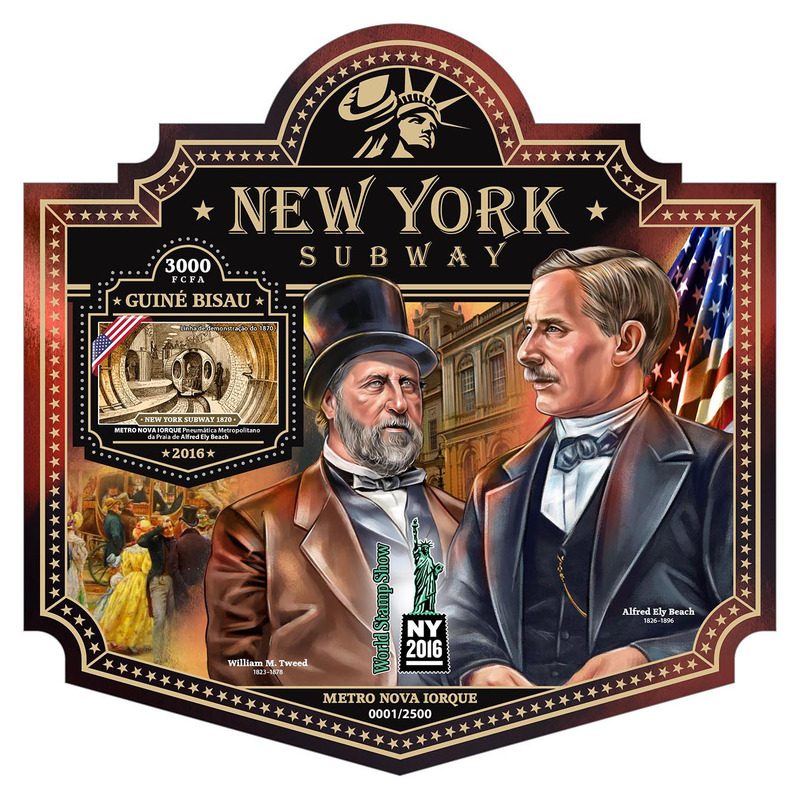 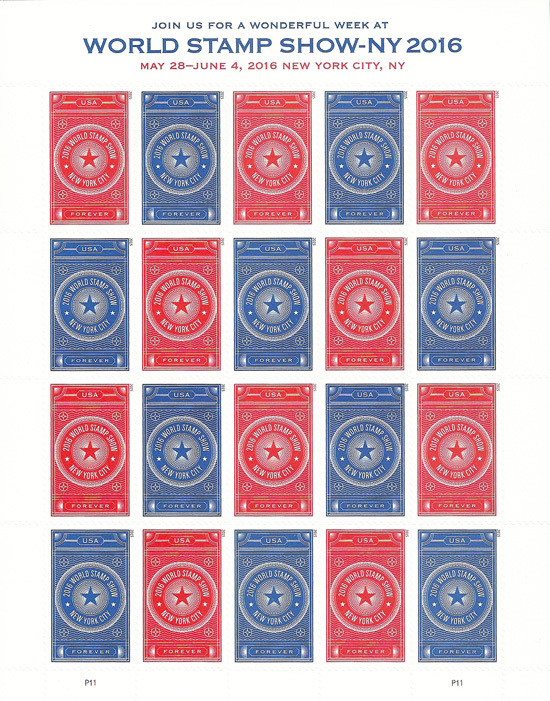 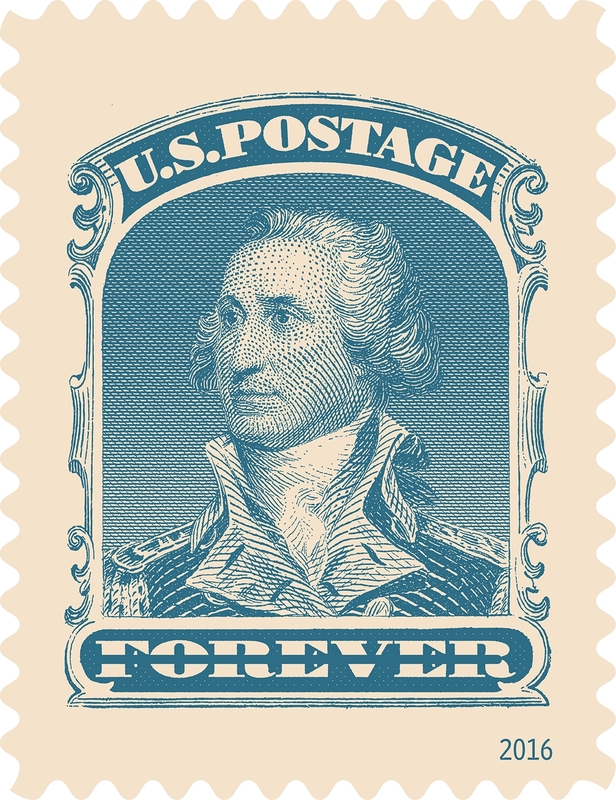 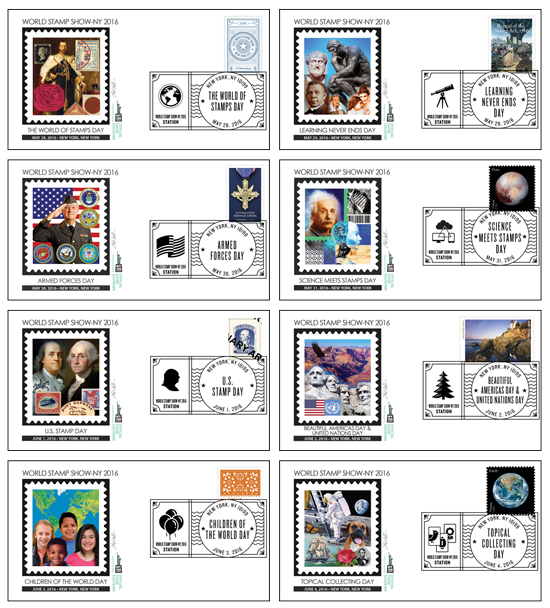 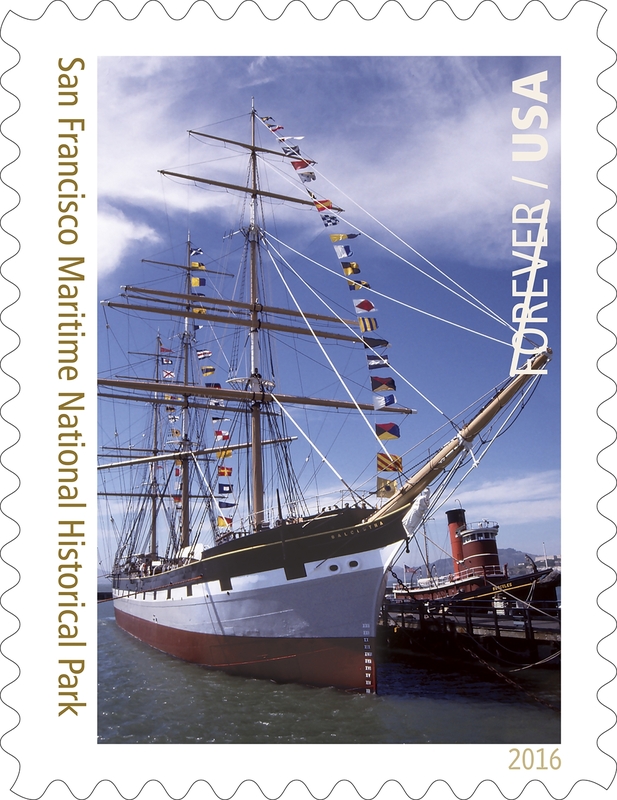 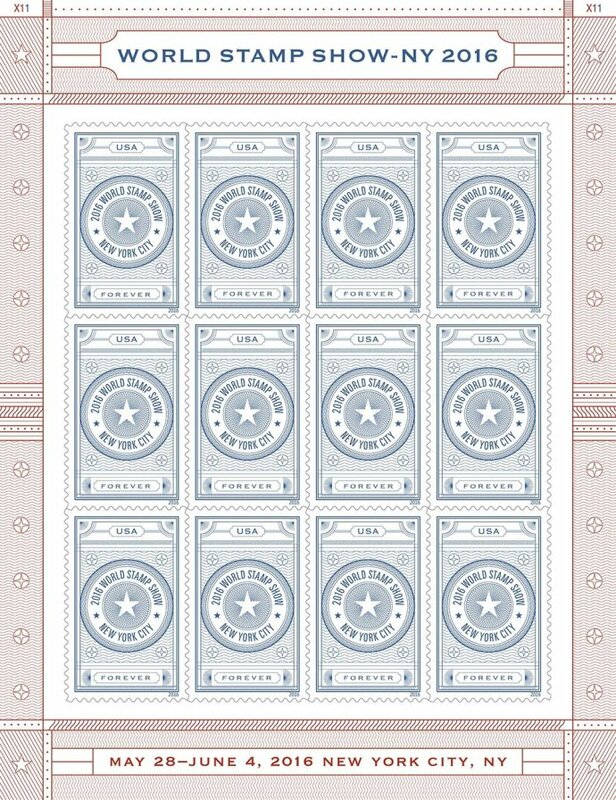 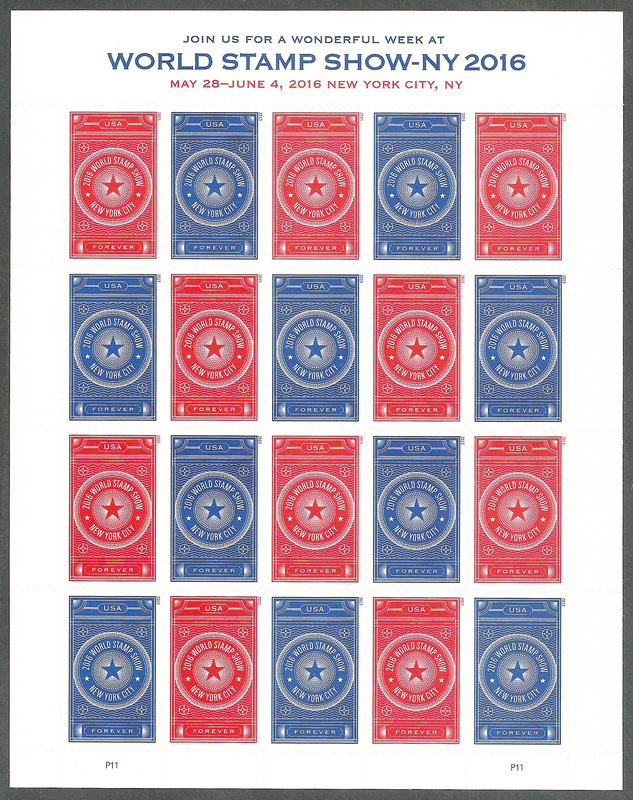 Six forever stamps will be issued in a single souvenir sheet to pay homage to classic U.S. stamps of the 19th century. 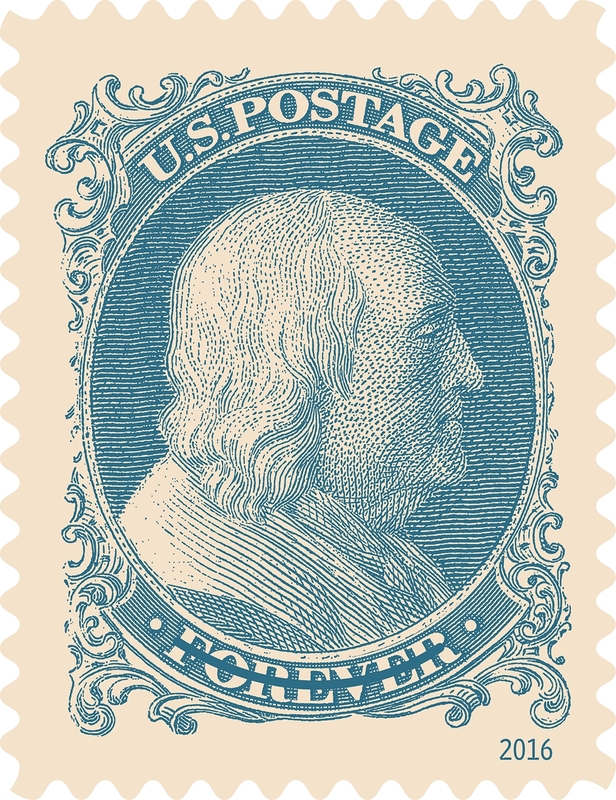 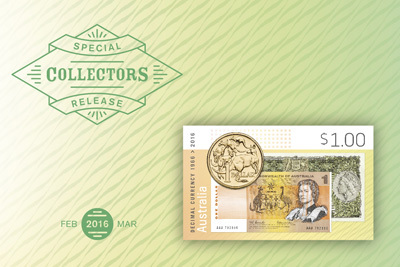 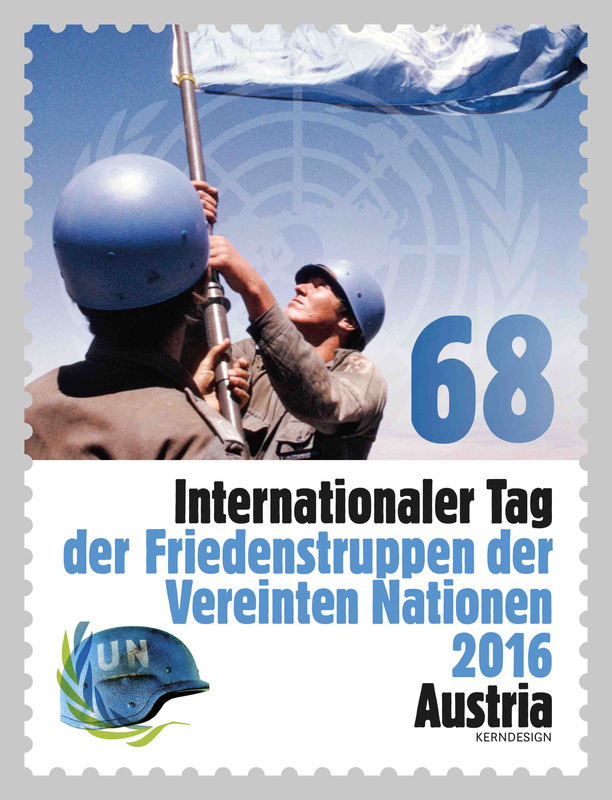 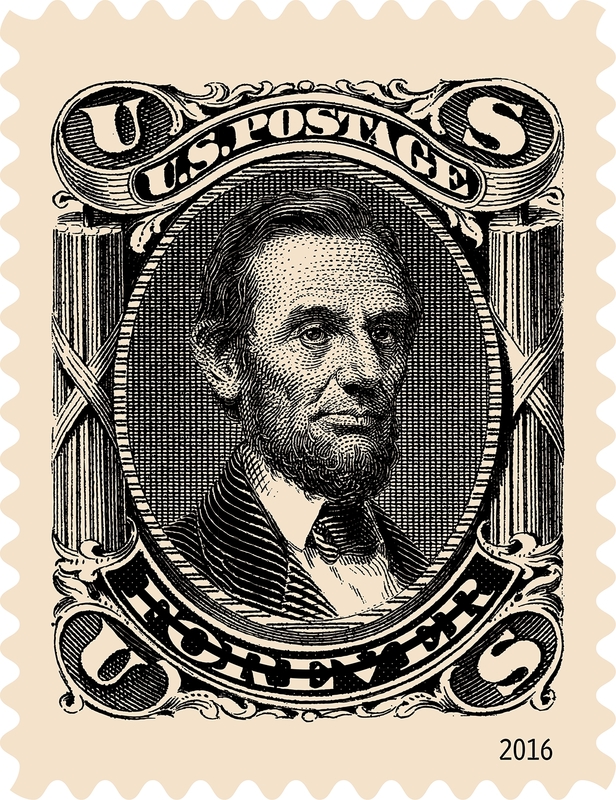 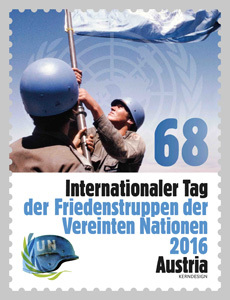 Each stamp reproduces the design of a different original issue, with the original denomination replaced with a “forever” inscription. 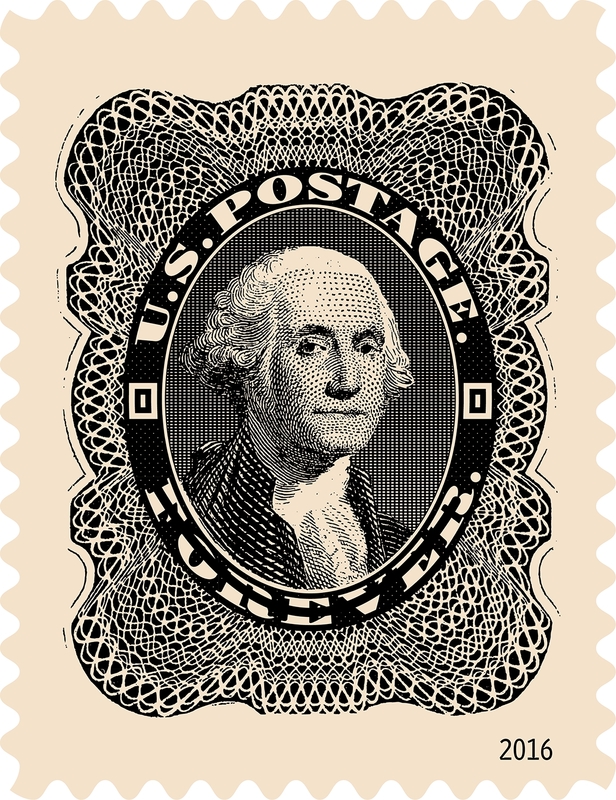 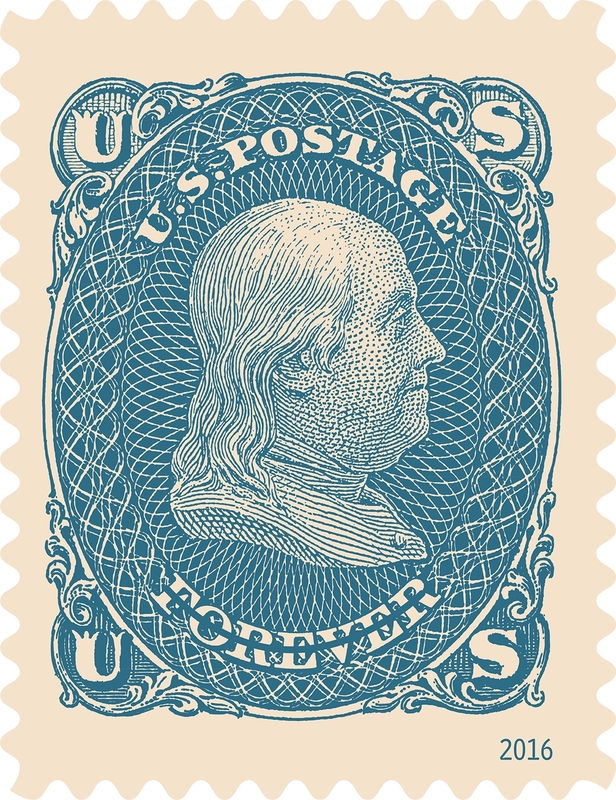 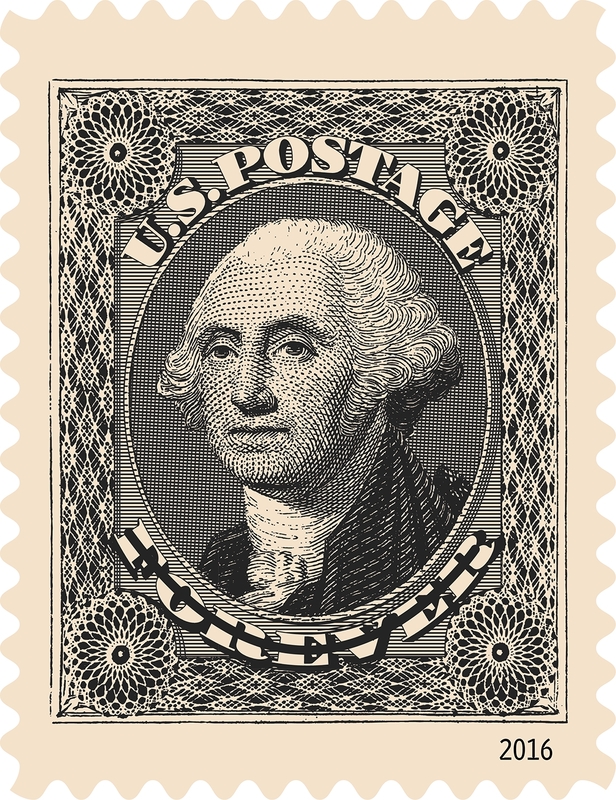 The stamps being featured are the 1851 12¢ George Washington, the 1851 1¢ Benjamin Franklin, the 1860 24¢ George Washington, the 1860 90¢ George Washington, the 1866 15¢ Abraham Lincoln, and the 1861 1¢ Benjamin Franklin. 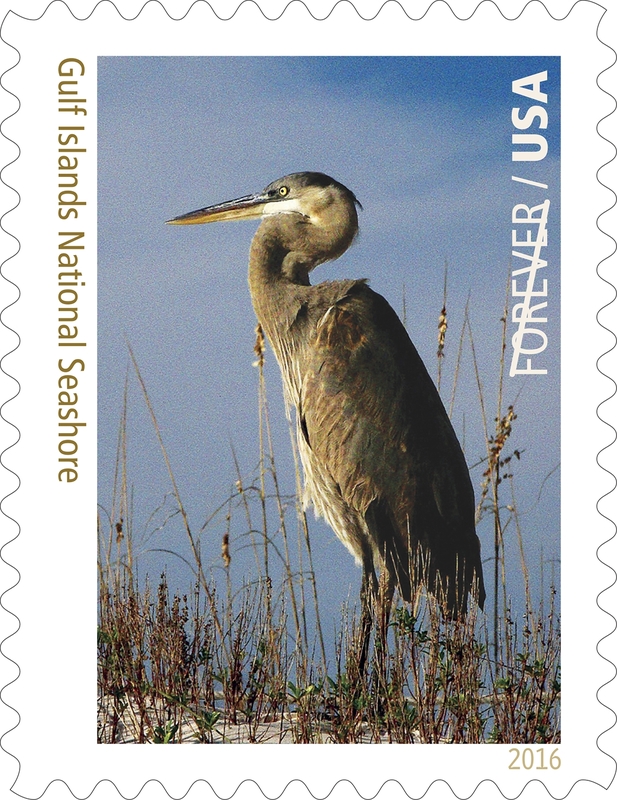 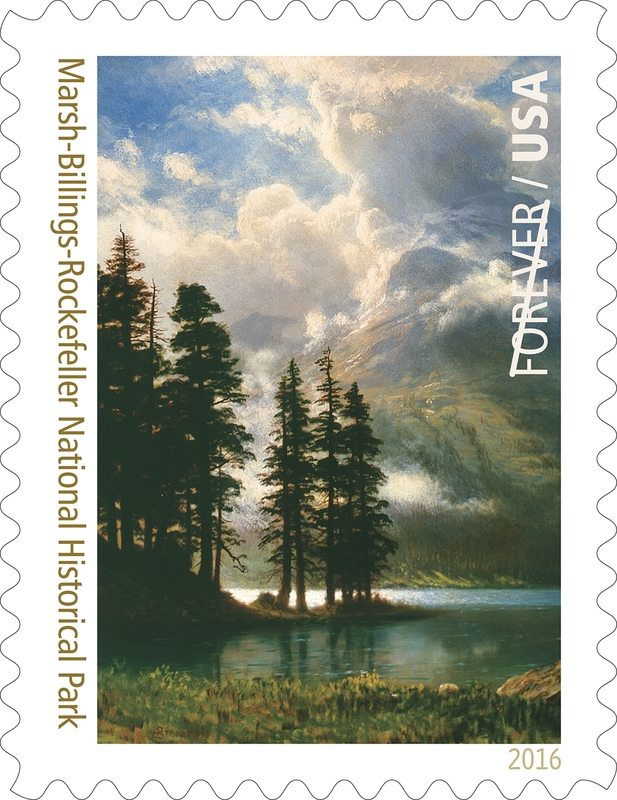 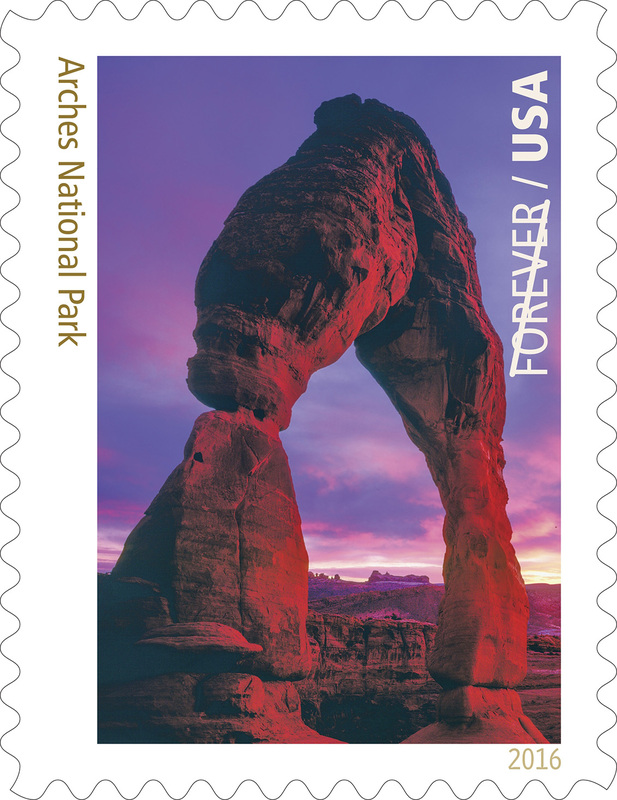 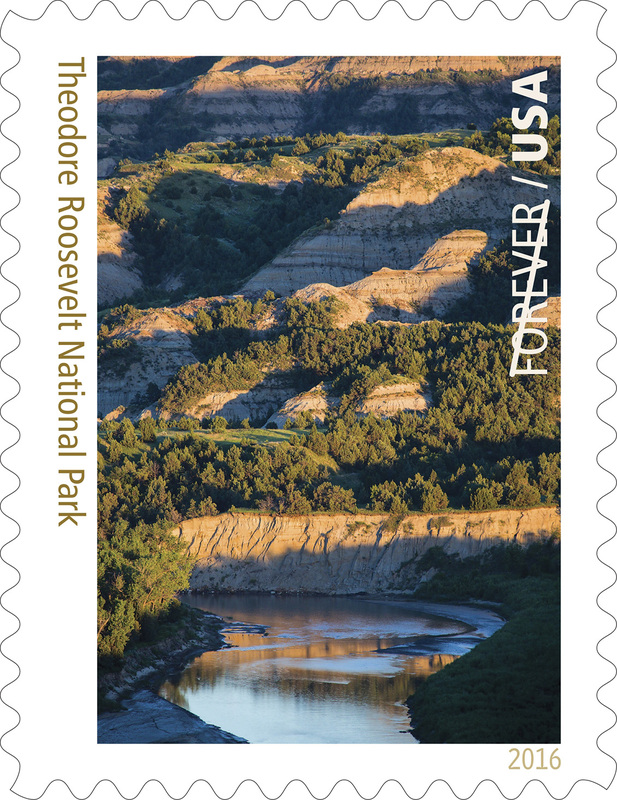 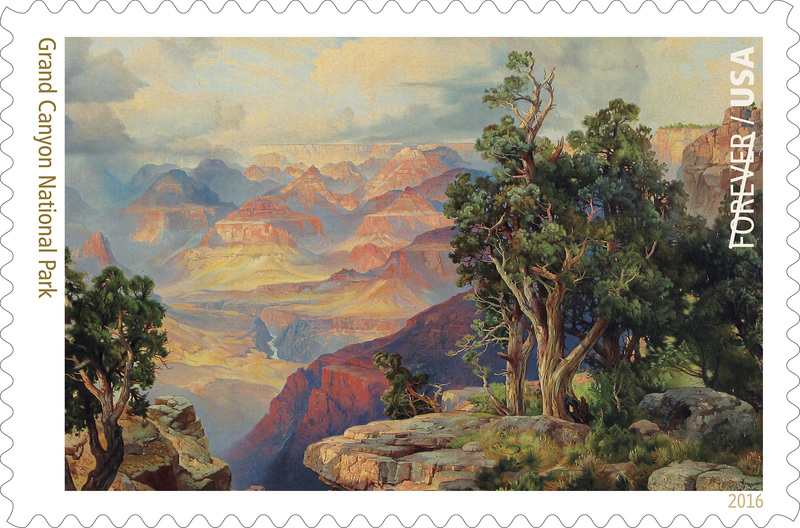 The Postal Service will issue 16 stamps honoring National Parks in what it describes as a pane of stunning forever stamps. 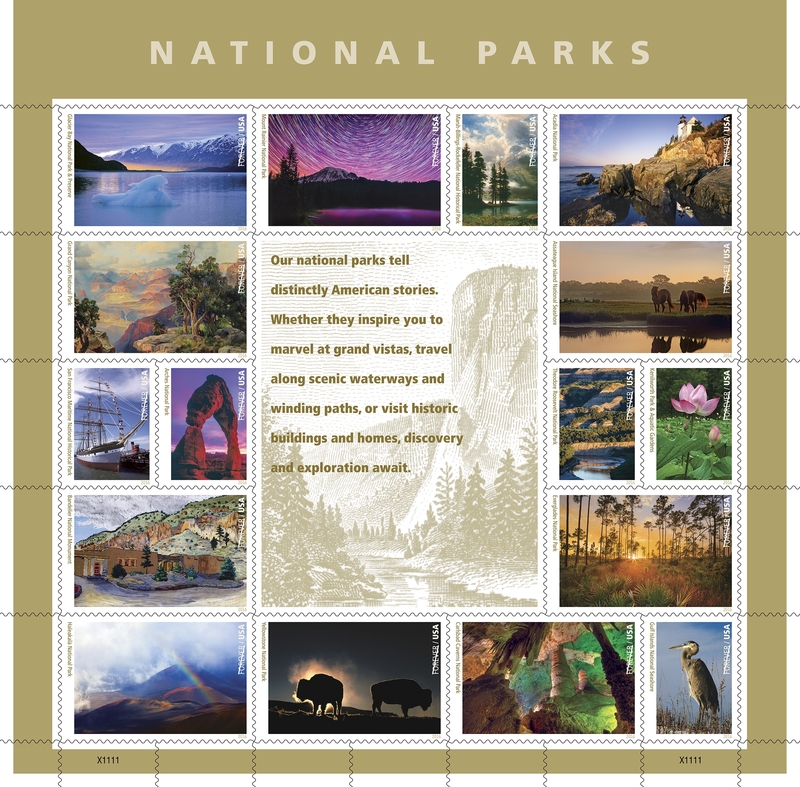 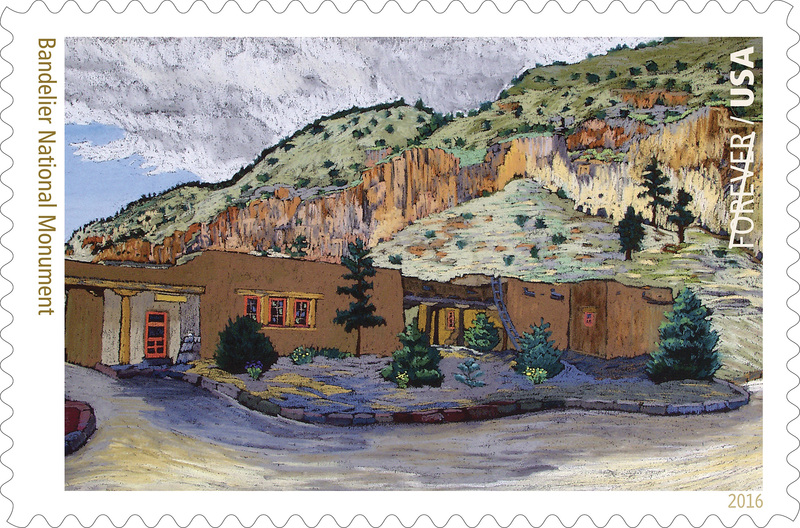 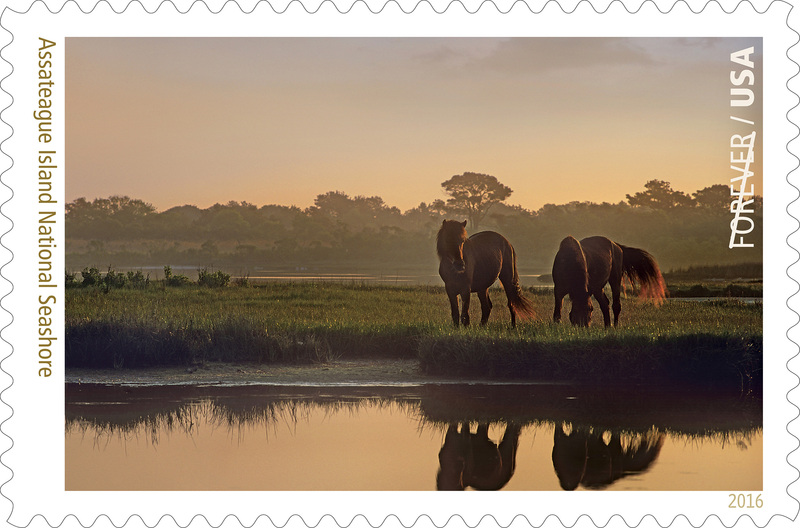 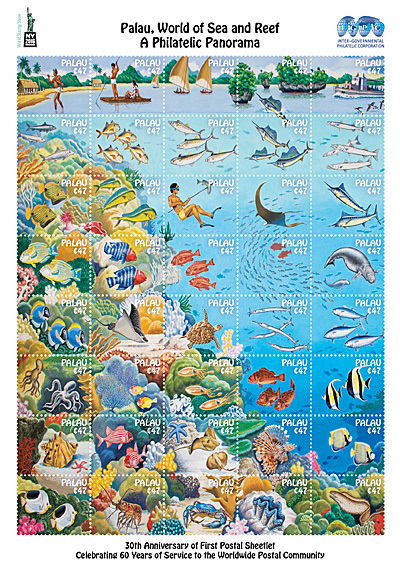 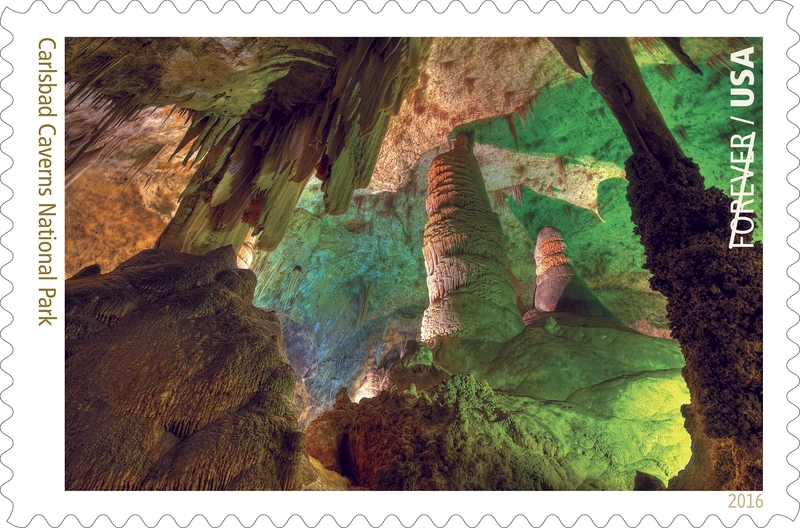 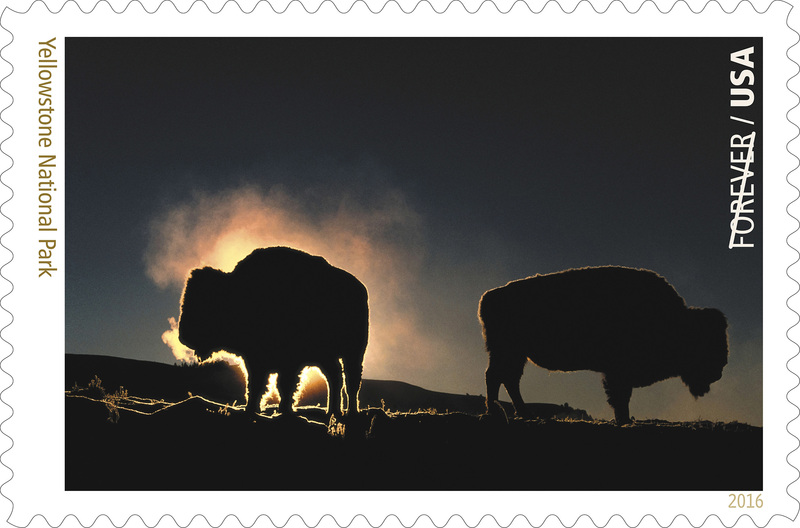 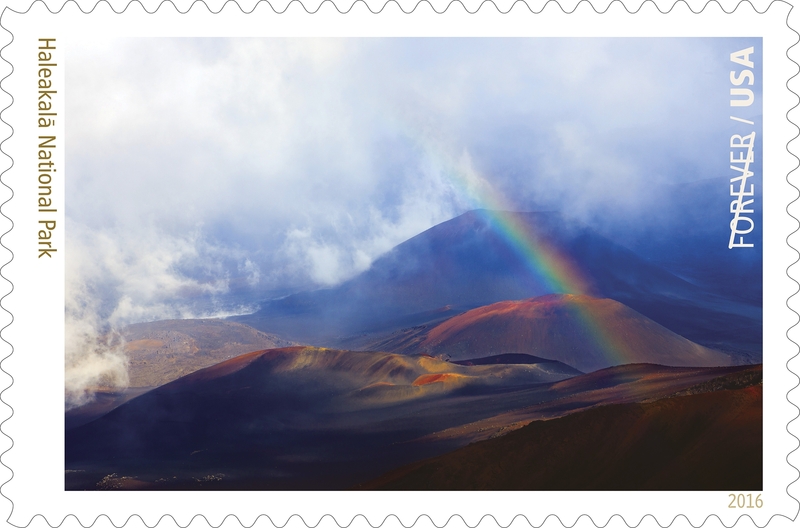 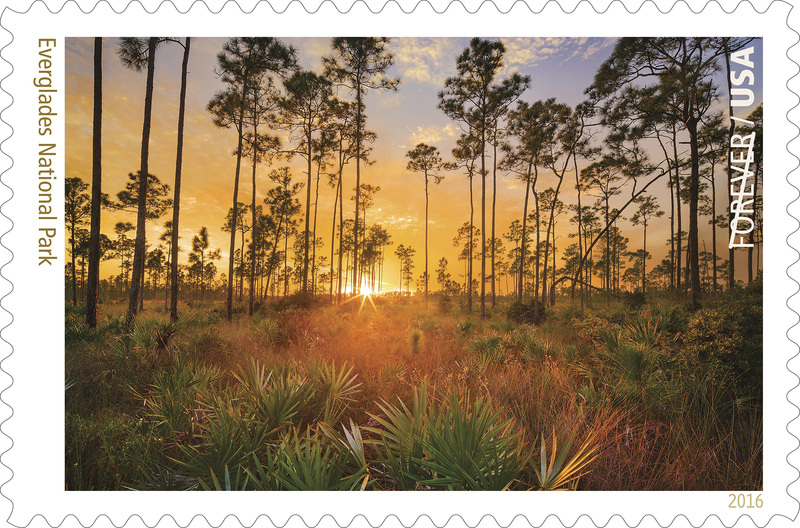 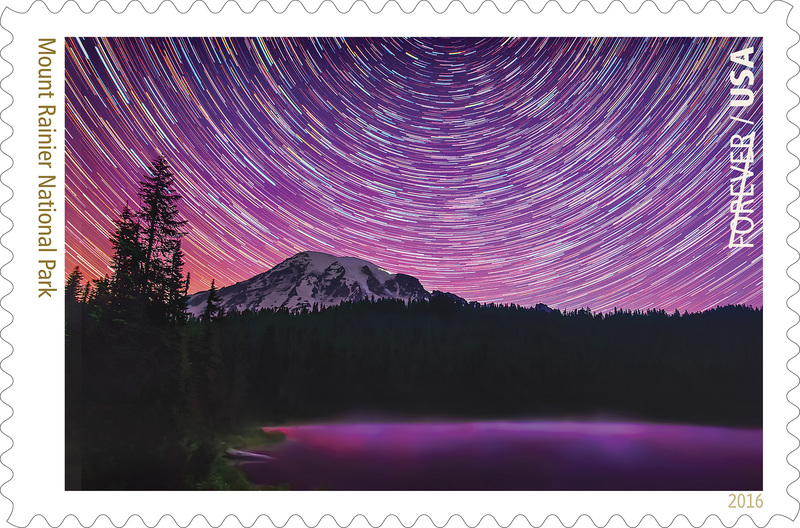 “These stamps celebrate the 100th anniversary of the National Parks and depict the beauty and diversity of these national treasures,” said Postmaster General Megan J. Brennan. “They serve as an inspiration for Americans to visit, learn and to write cherished memories of their trips to these incredible wonders.” The parks that will be honored and the designs on the stamps will be revealed one at a time over three weeks beginning April 4. 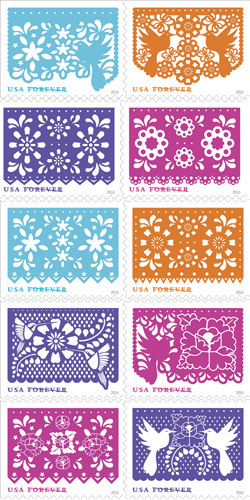 In a double-sided pane of 20, the Postal Service will offer 10 different forever stamps featuring designs reminiscent of the craft of papel picado, which translates to “pierced paper.” The intricate designs in this set show a variety of birds, flowers and patterns. 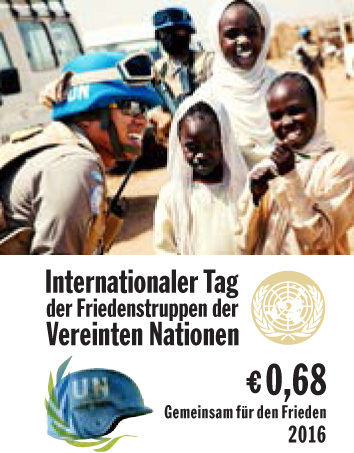 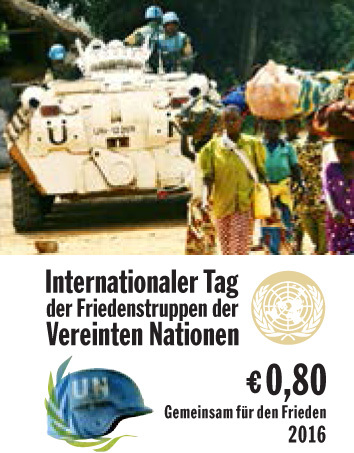 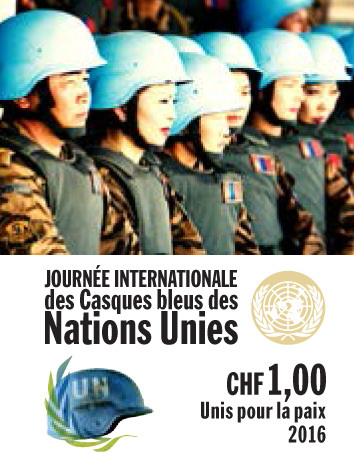 The series will contain denominations of US$0.47, US$1.15, CHF 1,00, CHF 1,50, Euro 0,68 and Euro 0,80, each in a sheet format of 20 stamps. 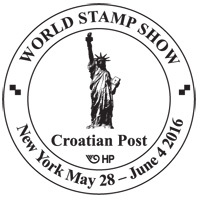 A special photo booth will be on-site to take attendee photos through the remainder of the show. 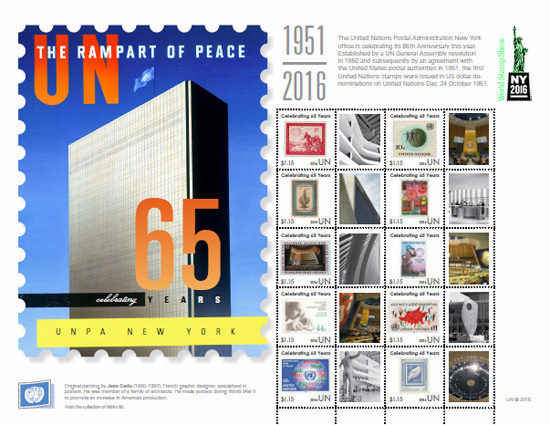 Special cancel only available this day at the UNPA booth. 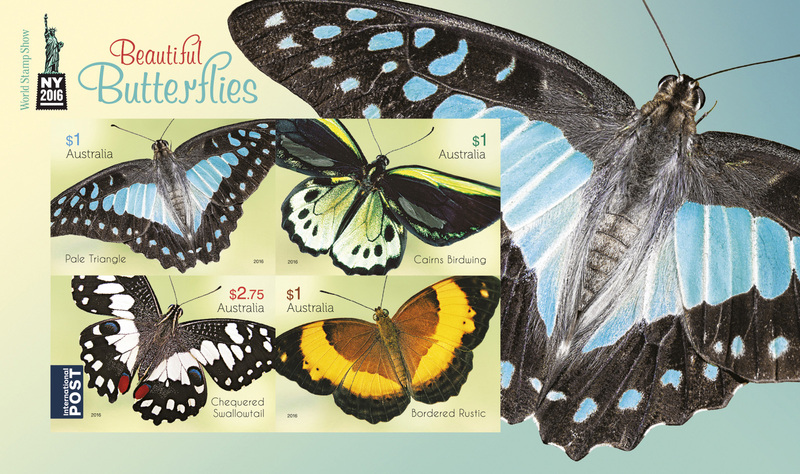 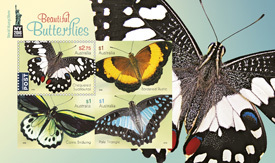 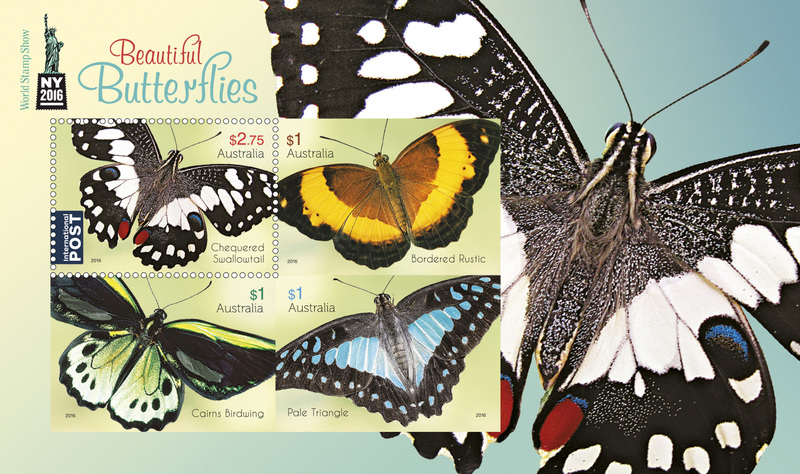 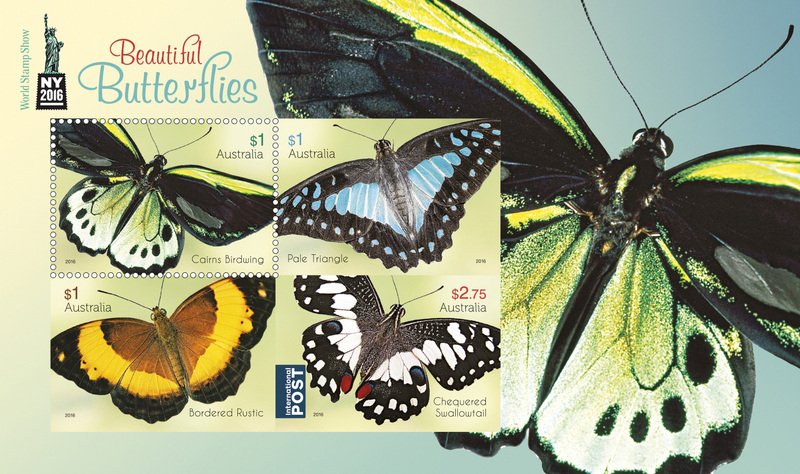 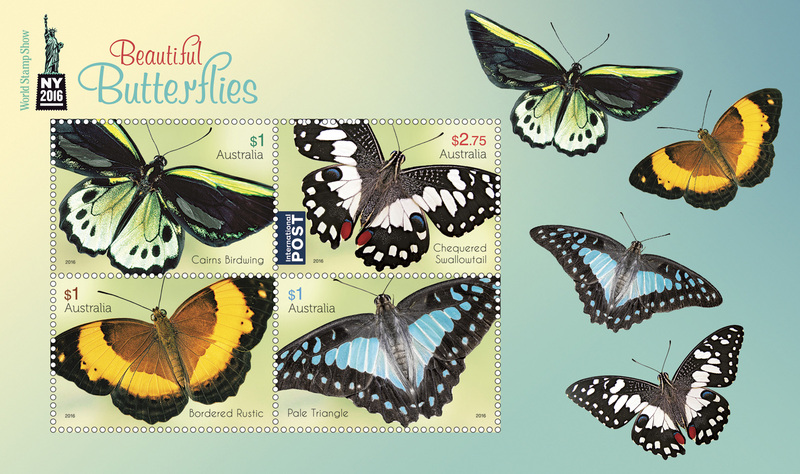 Beautiful Butterflies - Limited edition daily minisheet print variations showing various printing techniques. 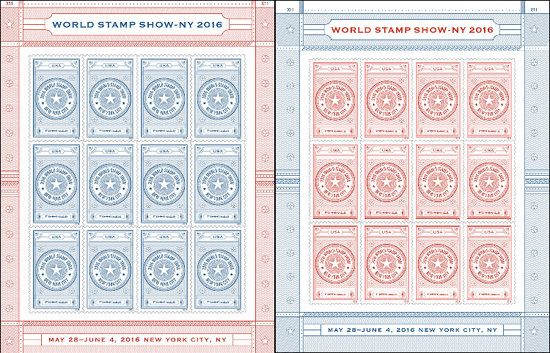 A limited number of foiled cancelled minisheets will be available each day and will only be available at the show. Gibraltar Post and Go labels vended from special machine GI01. 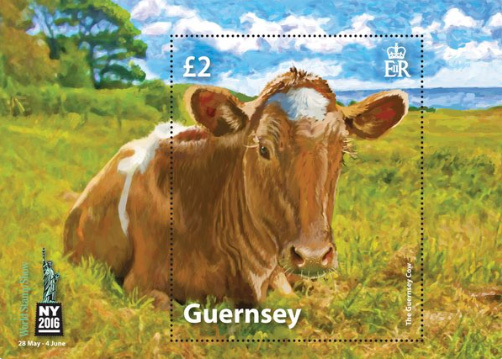 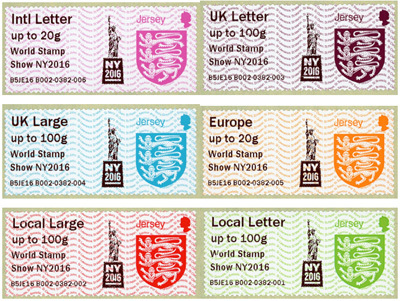 Guernsey Post and Go flag label and "Life" set of 6 vended from special kiosk GG01. Jersey Post and Go label sest of 6 vended from special kiosk JE01. 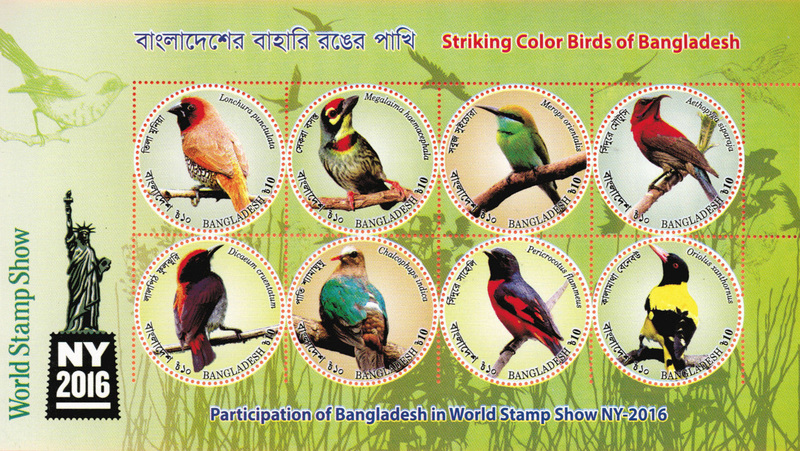 Printed by International Security Printers (Cartor) in lithography. 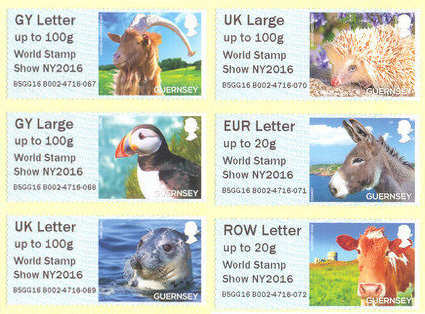 Post & Go labels: The Royal Mail stand had 2 kiosks: A011 and A012 machines. 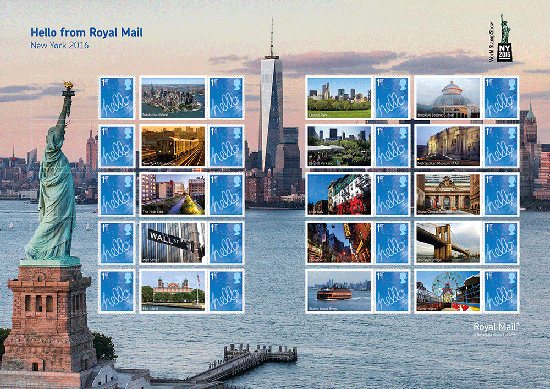 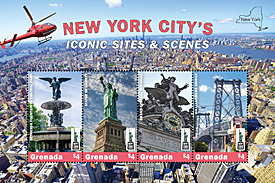 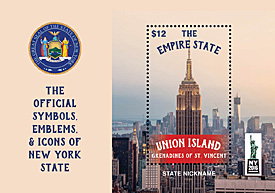 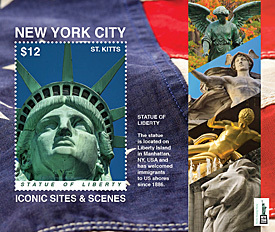 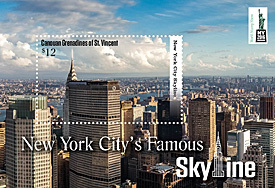 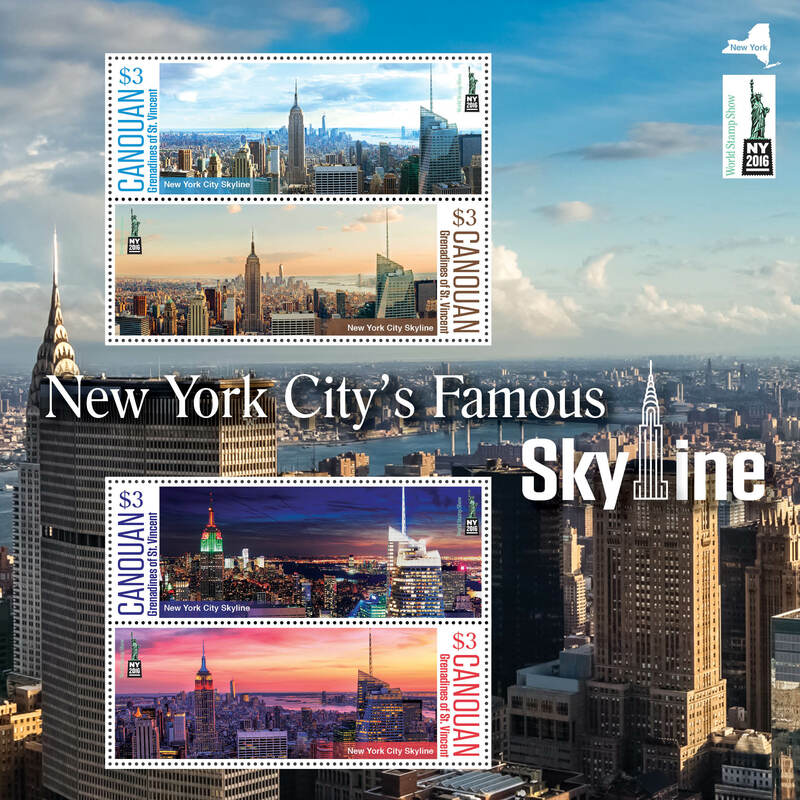 The New York skyline design from the Sea Travel set, issued in September 2015, and the Union Flag design was vended with a "World Stamp Show NY2016" overprint. 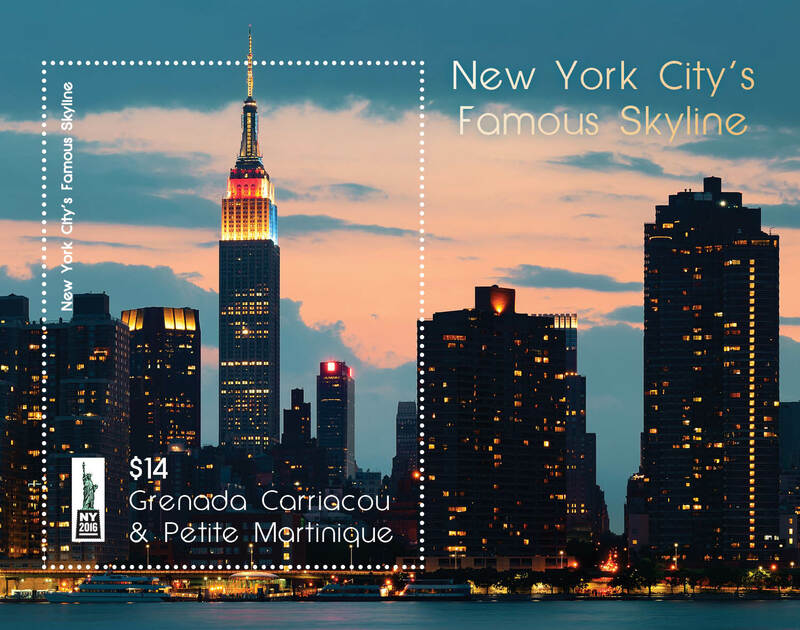 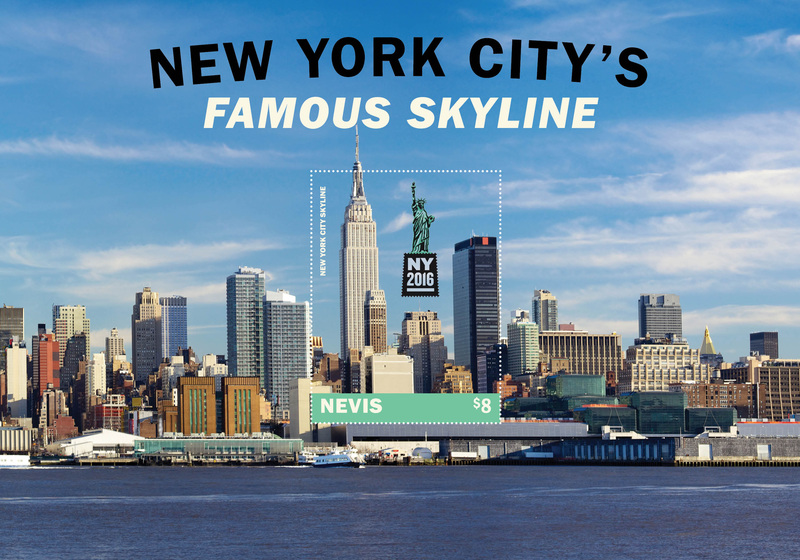 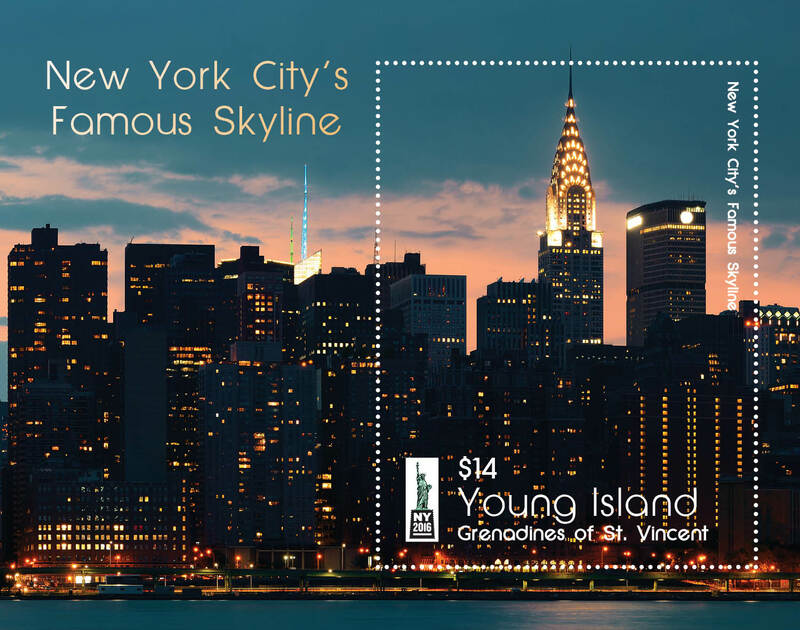 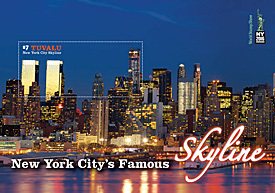 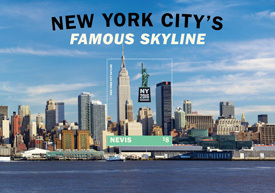 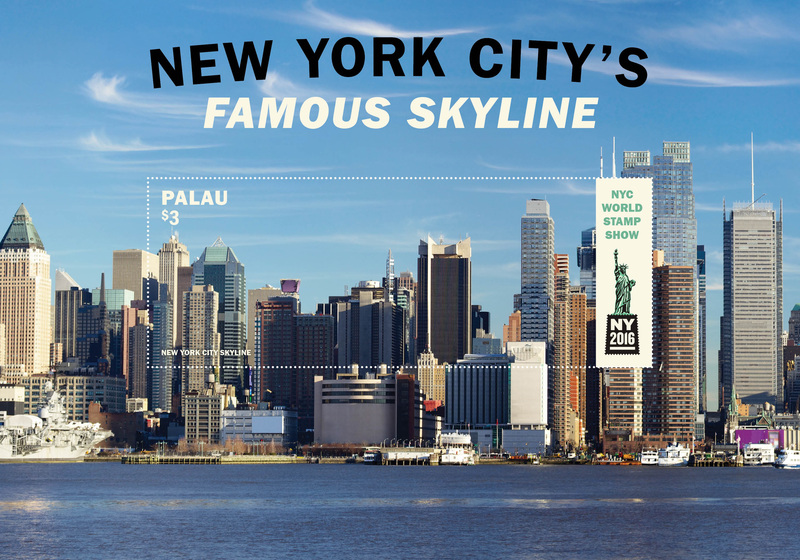 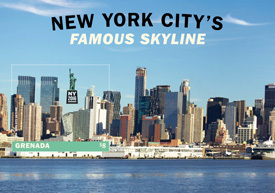 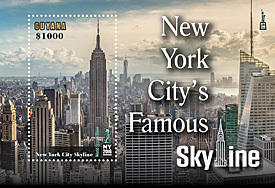 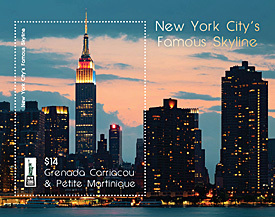 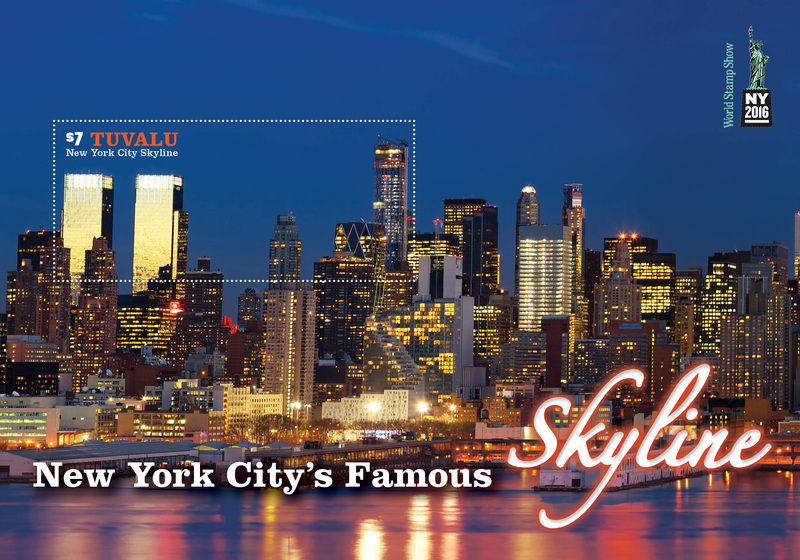 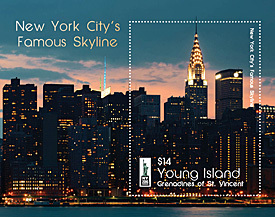 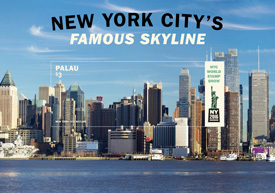 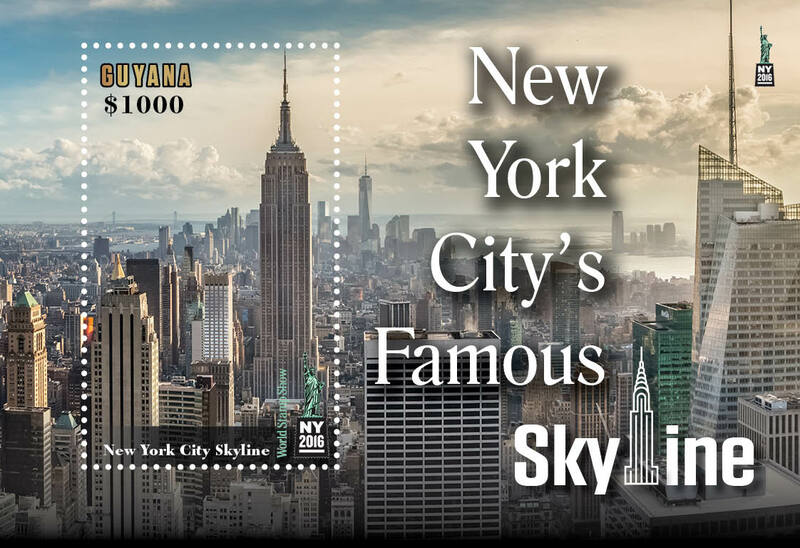 Unlike recent single design reels, the New York skyline stamp was produced in gravure alongside the original set and pre-dated the digital production capability.